Posted on February 5, 2015 by Elizabeth E.
That title is a mouthful. Did I get it all? 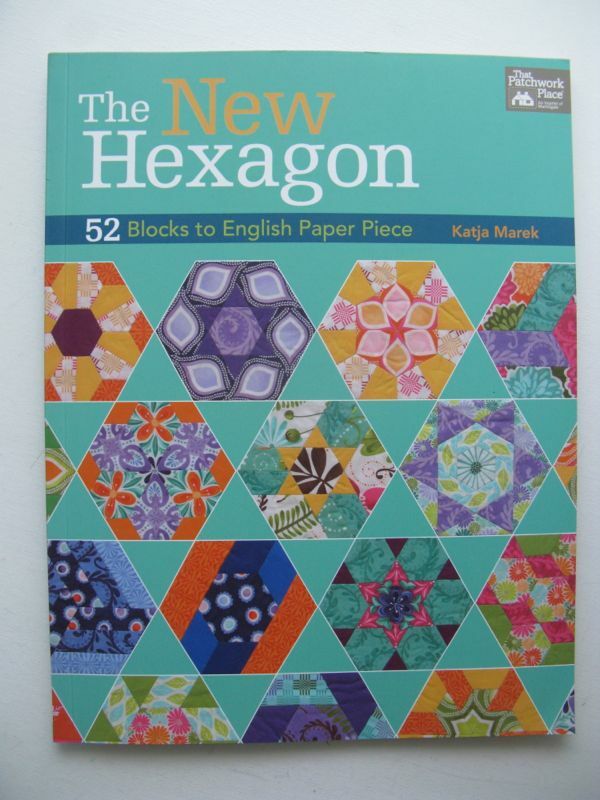 Katja Marek, who wrote this book, is hosting Mother Hen to all of us as we work our way towards having a new version of a millefiore quilt, based on the blocks in her book. Laurel and Rhonda and Cindy and about 1500 of my other closest friends are doing this. 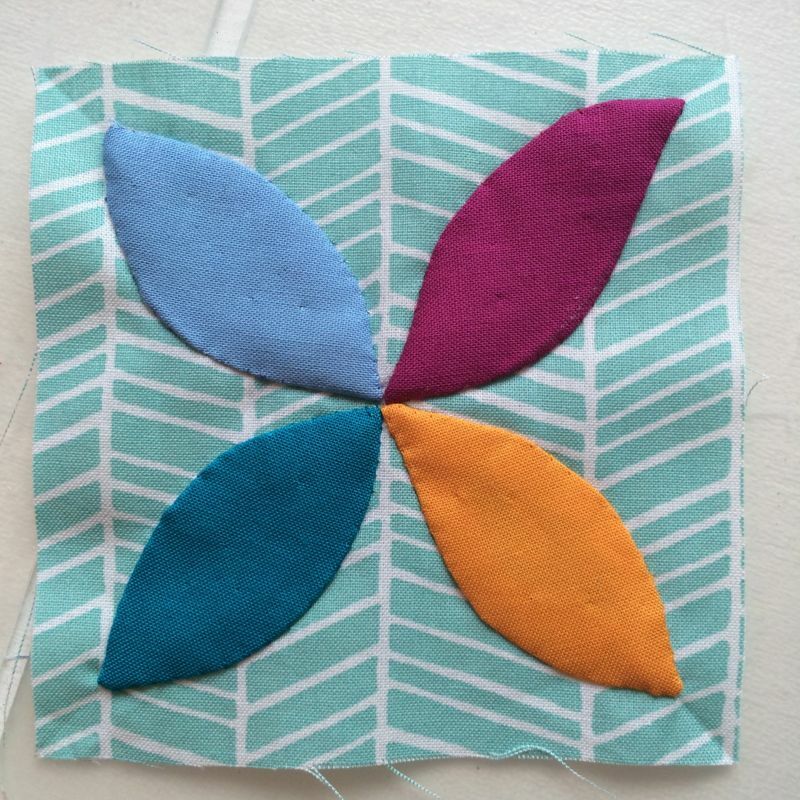 It’s fun to see the rosettes pop up on Instagram and in my Google Images when I search for them for inspiration. 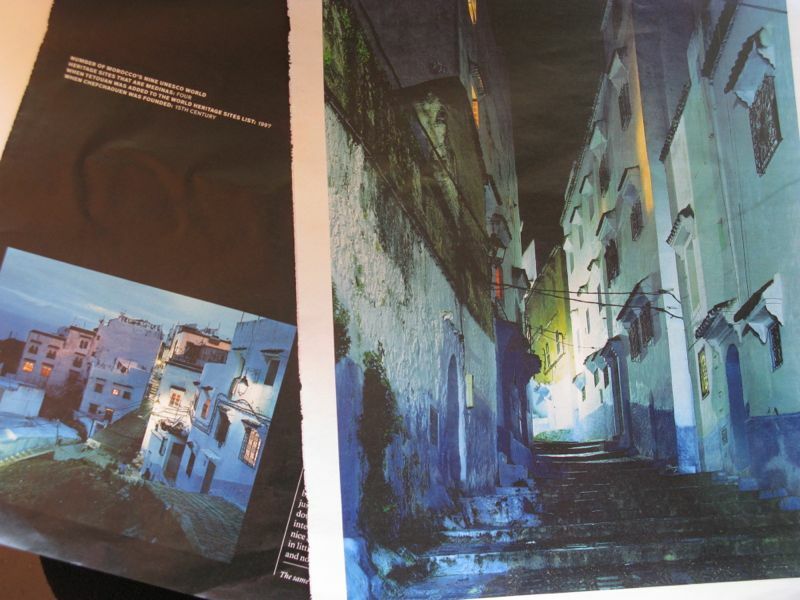 I’d pulled these pages of a Morocan town out of the travel magazine, with all their aquas and moody blues, yellow-greens and dark blues as inspiration, then pulled a bunch of fabrics. For a long time they were pinned into my design wall, but then I needed the wall, so they now live in this basket. 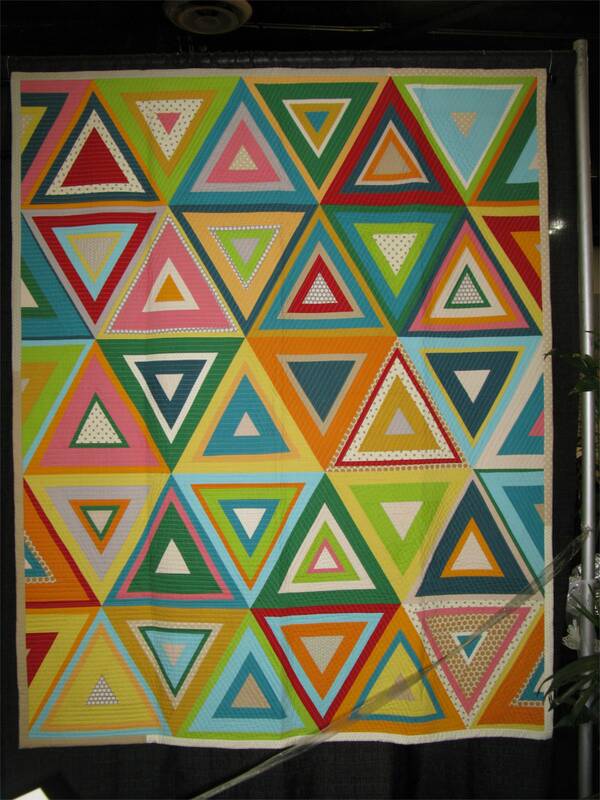 The very middle six triangles are the center, and here you see round one, of Rosette One. 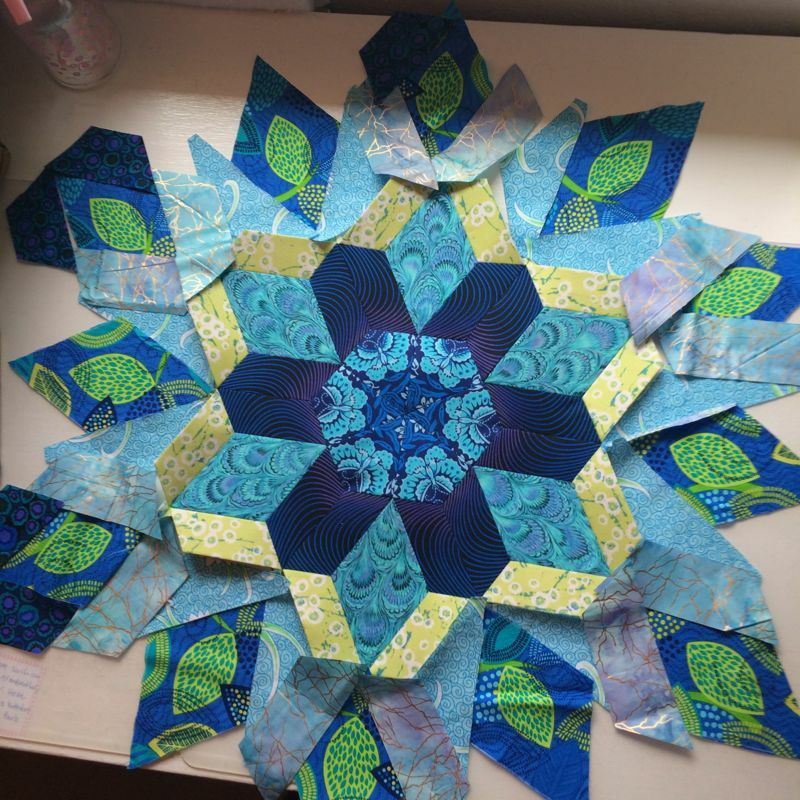 Katja sends us an email every month, telling us about the next rosette. I act like we’ve done this for years, but really we all started in January. Well, people who weren’t trying to get a college English class up and going started January first, but the others of us began like, last week or so. Here I’m plotting Round Two. Still plotting. I ordered the templates from Paper Pieces, as suggested, mainly because my brain just couldn’t handle one more decision. A good choice for me, but I know others are tracing them off. 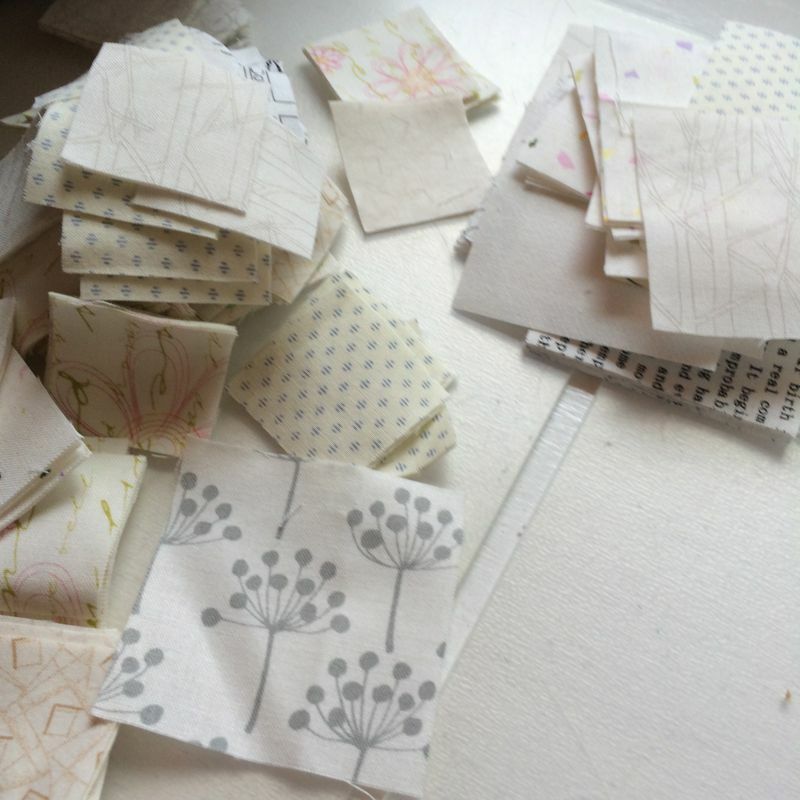 Definitely do the glue stick thing when you attach your fabric to the paper pieces. It’s brilliant. Tonight, as I watched The Muppet Movie (the most recent one with Tina Fey, who made me laugh), I finished off the third round of Rosette One. I have one more round to go. This thing is getting really big, so I decided to pop out the interior papers. I loosen the edges by sliding underneath them with my stiletto, and they pop right out. Fun to be at this point. 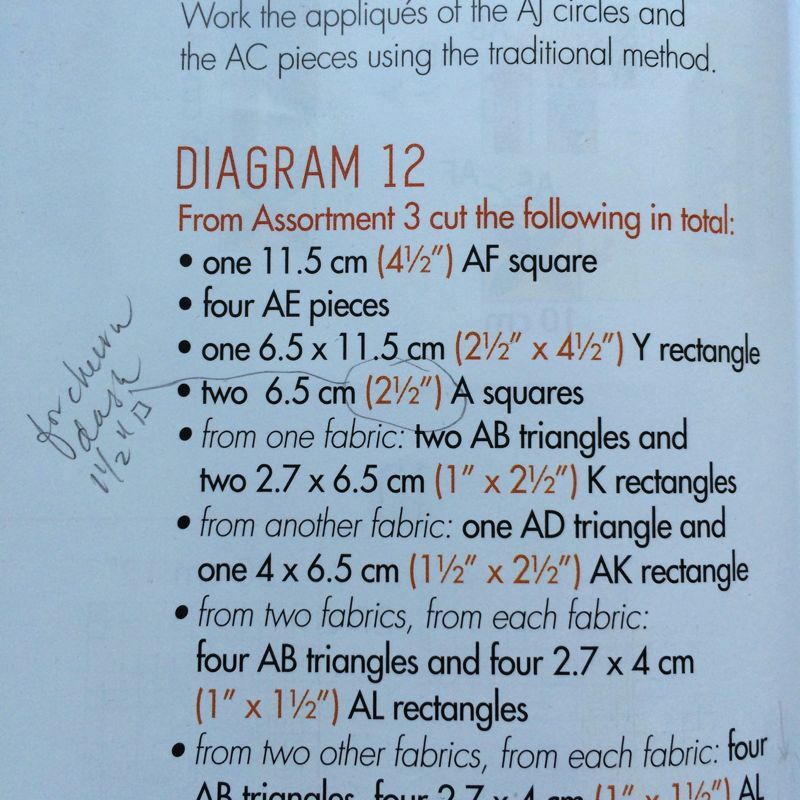 Tomorrow, after I grade six more essays (I had a batch come in on Wednesday and I’m doing six-a-day until they are done), I’ll pull all those fabrics out of my basket and make a bigger mess in here (see photos below). I also wrote up my goals for the quarter, conveniently skipping January because we all know what that month was like. I can already see some holes in the quarter, like where are the Circle Blocks? One a month? Okay, this was a couple of days ago, but you get my drift. 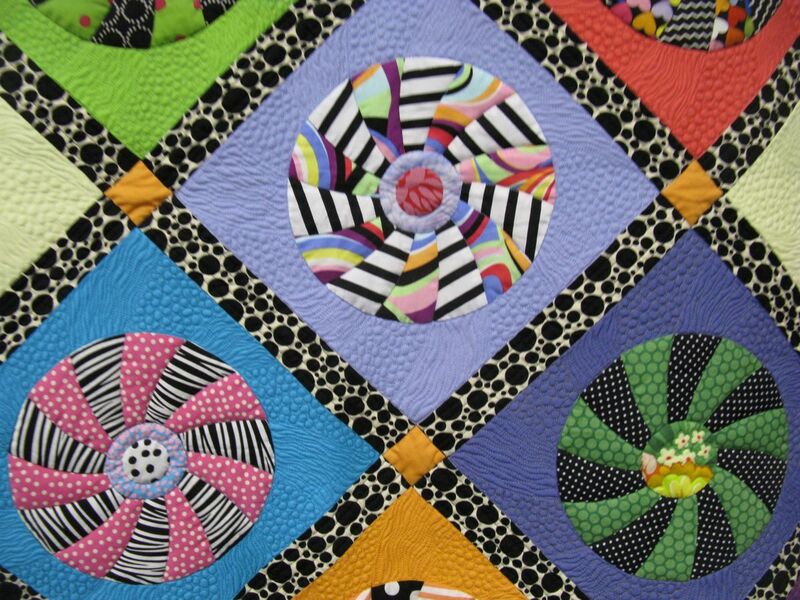 They have thought of everything to make us freaked out, excited quilters. 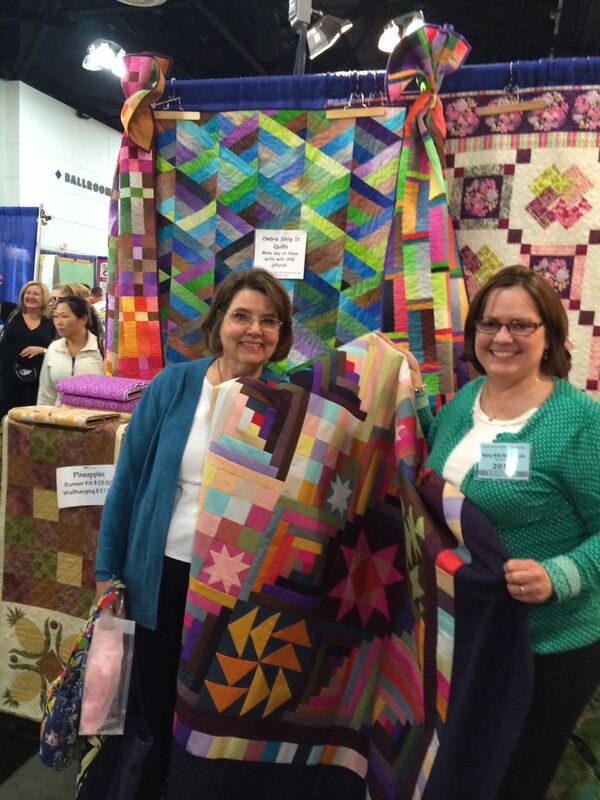 It’s like it’s more than a Quilt Show…it’s a Life Changing Event. 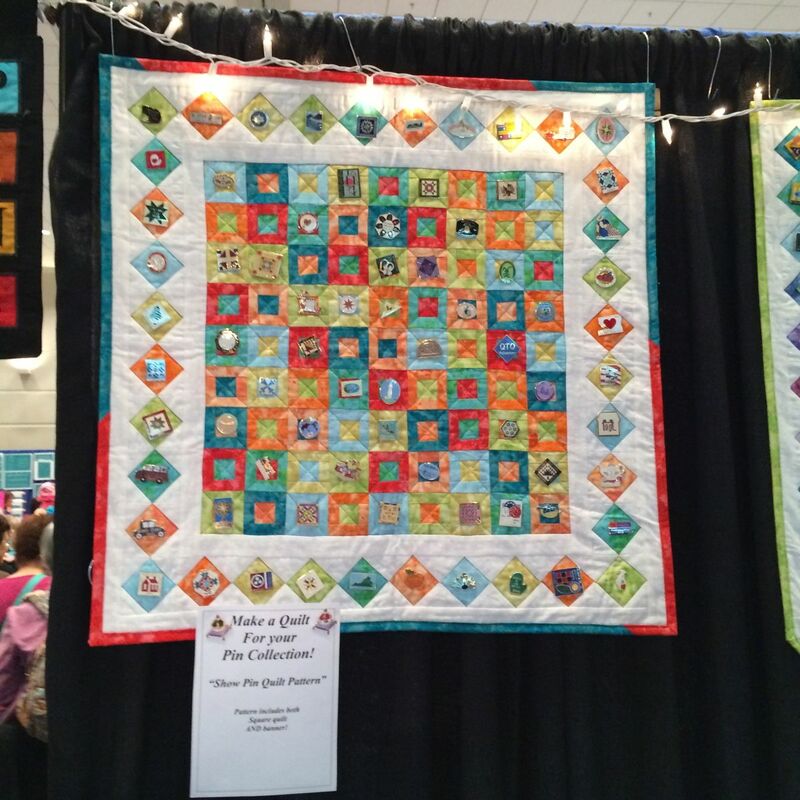 I think of it as a way to party with quilters, and certainly these young’uns will be a different bunch than the usual staid quilters. I knew this because one of the items in their scavenger hunt is to find someone whose tattoo I love. Right. 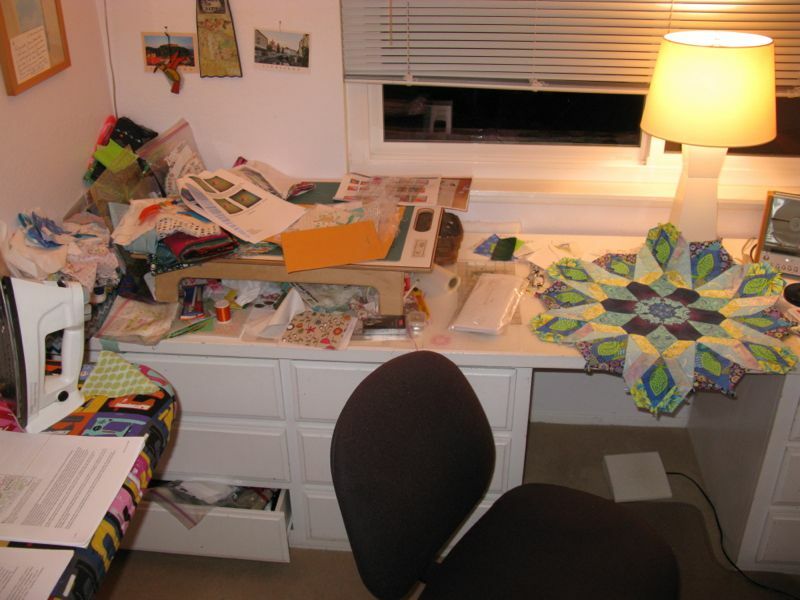 Okay, so between the prepping, grading, planning and working on everything else, here is a Truthy Moment: the mess at my sewing desk. I expect it will be clean, say, about July. 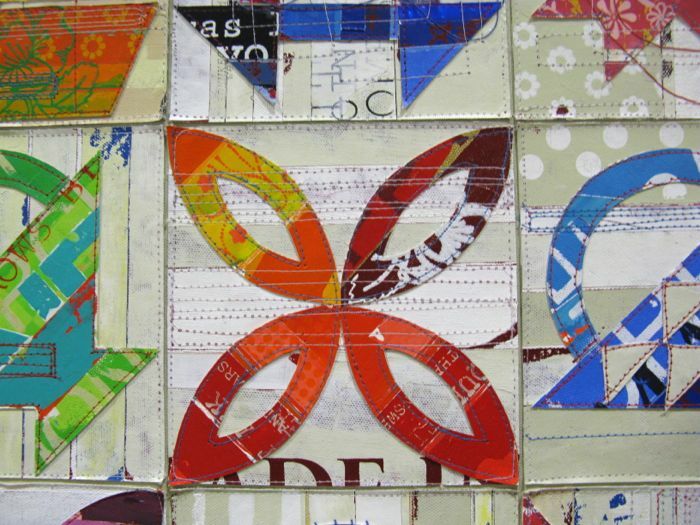 I loved reading all your comments about our recent Four-in-Art quilts, and am slowly working my way through them. Somehow the internet swallowed a few comments, so I have to go and find them. I can see them on the website, but not in my email, where I usually answer them. Thank you all for the lovely things you wrote. 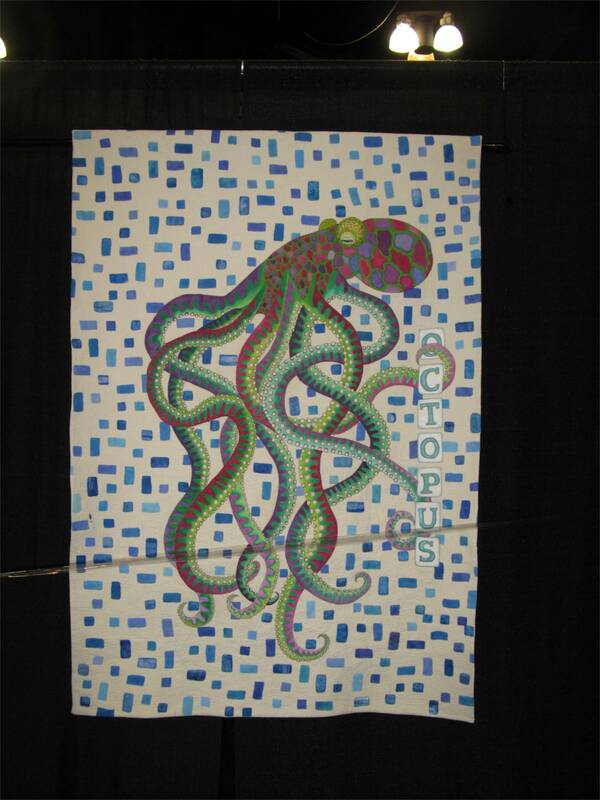 I think we were energized by new members, the new yearly theme and the added bonus of choosing our own quarterly theme. Now you know why I ordered my papers for my hexagon. Way too many decisions! P.S. 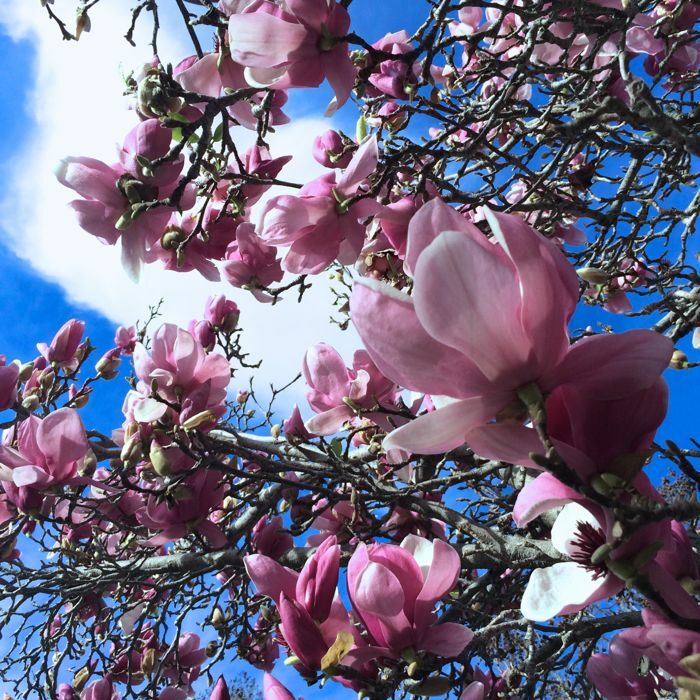 I think Spring is trying to happen out here! 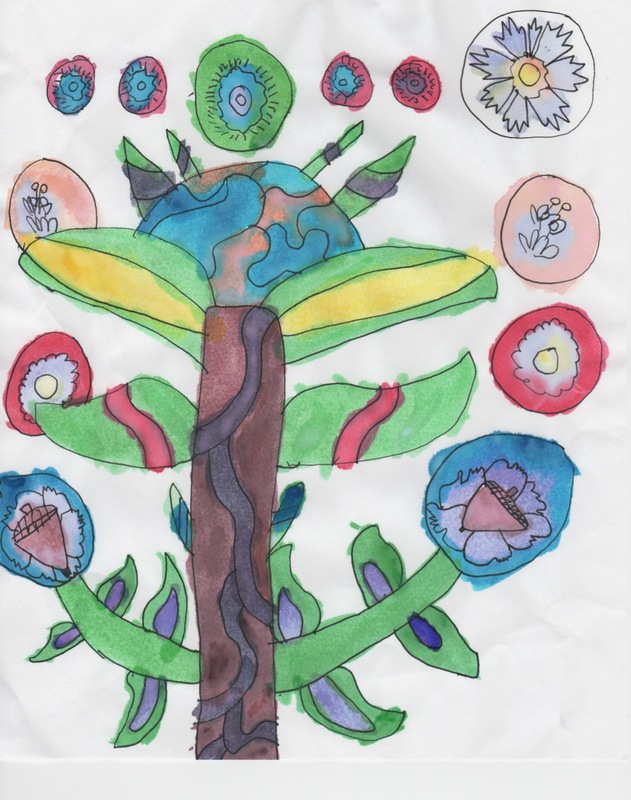 Posted on May 5, 2014 by Elizabeth E.
Some time ago, my granddaughter Keagan saw my blocks up on my design wall, and quietly made a picture for me of what she saw. 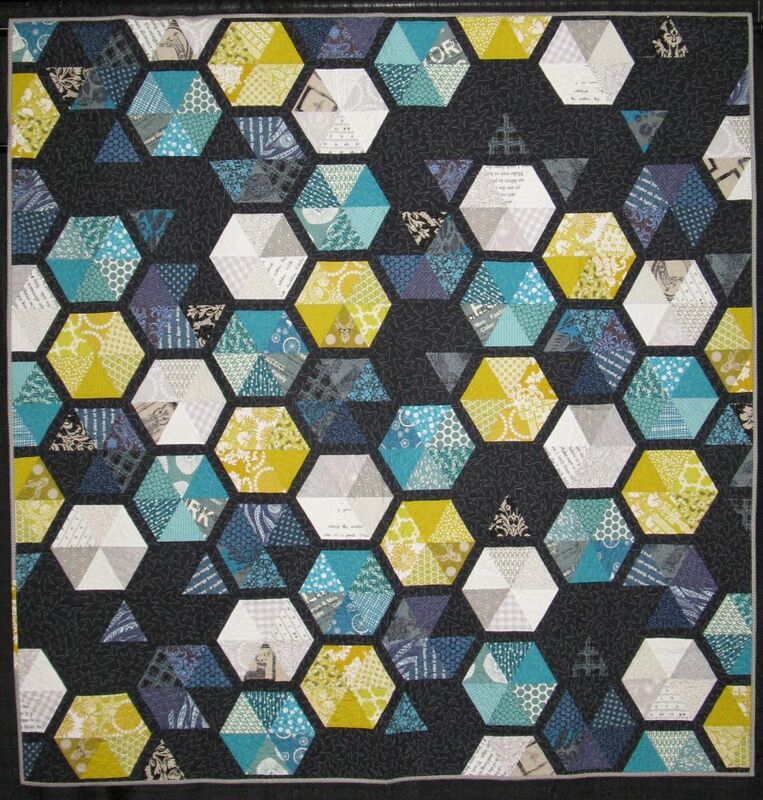 (I think it’s the block in the lower righthand corner of the quilt.) I love it, so I put it on the label. This blog software has an excellent search engine box. 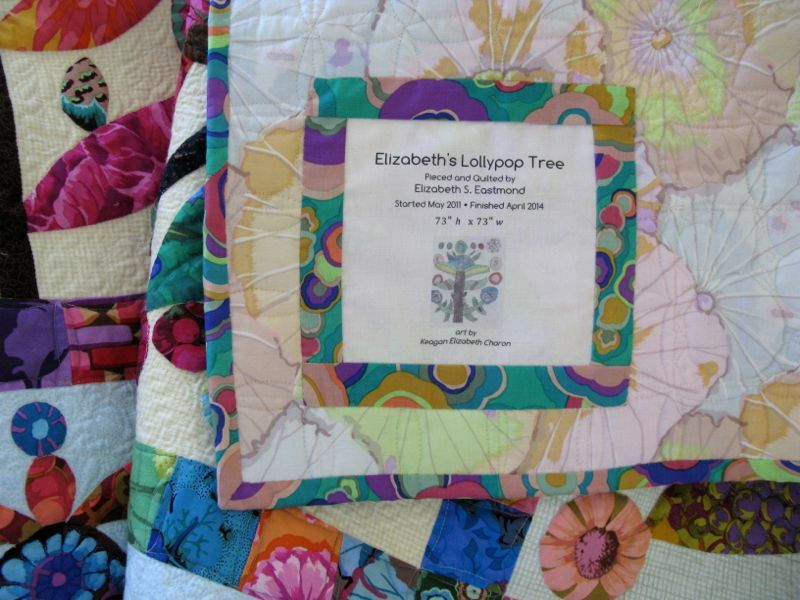 If you want to see details about this quilt, type “Lollypop Trees” in the search box to the right, and you’ll get more posts than you know what to do with. If you have specific questions, feel free to leave a comment and I’ll get back to you. Thank you to all who cheered me on and kept me going, in spite of days of wondering if I’d ever finish. 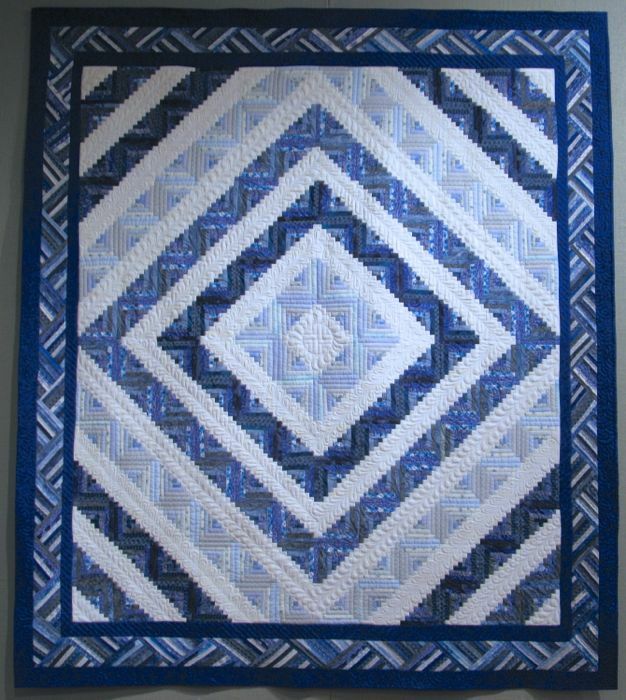 It’s very satisfying to see that quilt, to run my fingers over the quilting, and to know that I did it. That’s three finishes in two weeks. 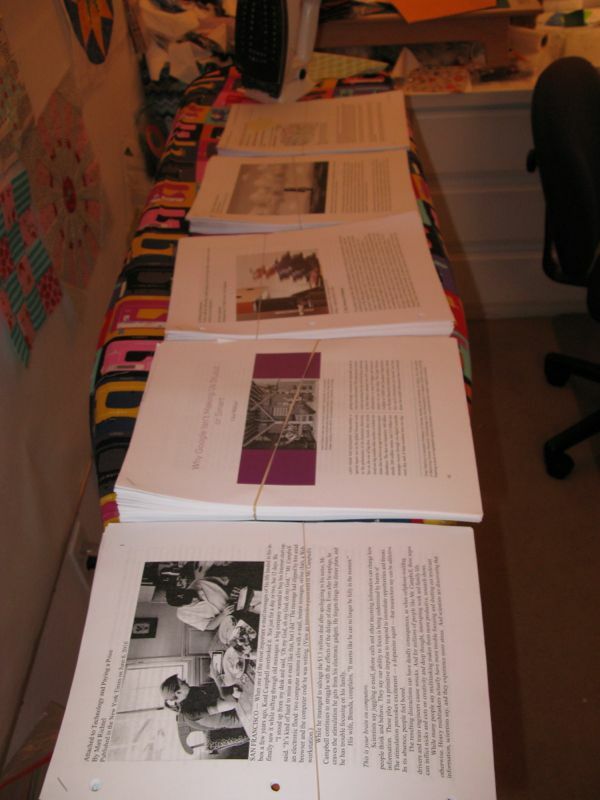 Now to grade research papers until my brains fall out and my fingers fall off. But look! 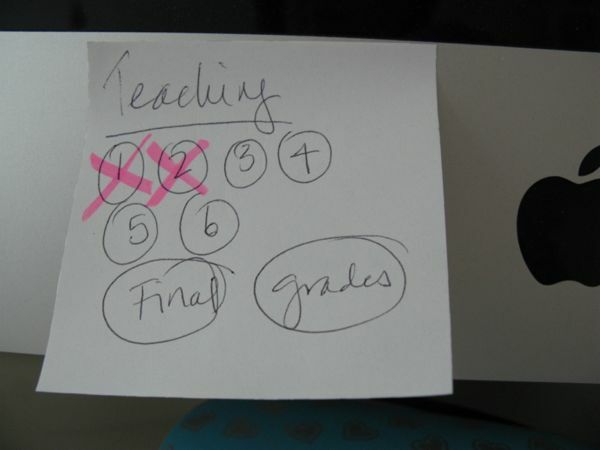 Only four more days of teaching in this semester! 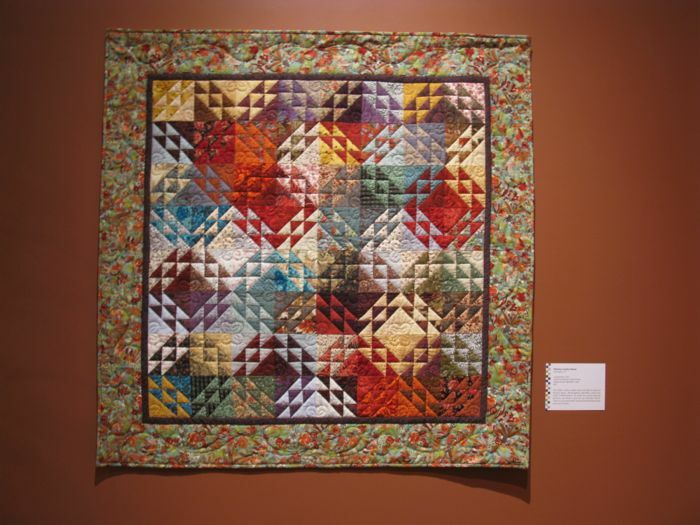 Posted on February 4, 2014 by Elizabeth E.
There was a great exhibit of quilts from the book I was lucky enough to be in: Amish Quilts, The Adventure Continues. 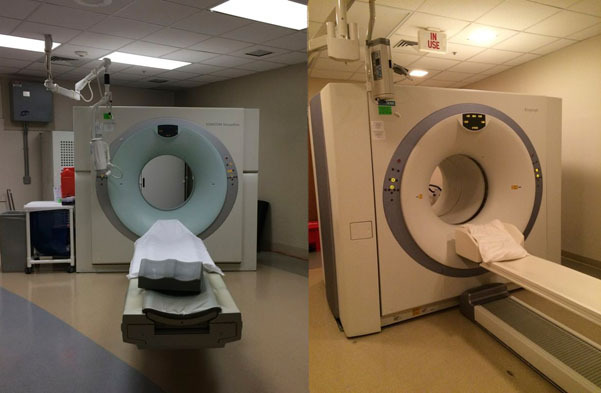 As always, seeing them in person, beats a flat picture or a digital photograph any day. 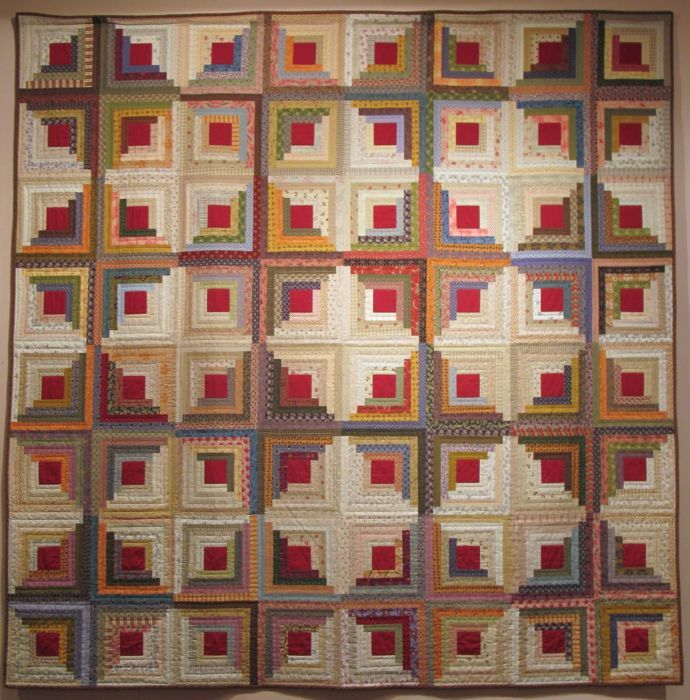 (How has that changed what we esteem as “good” quilts? Just something to think about.) 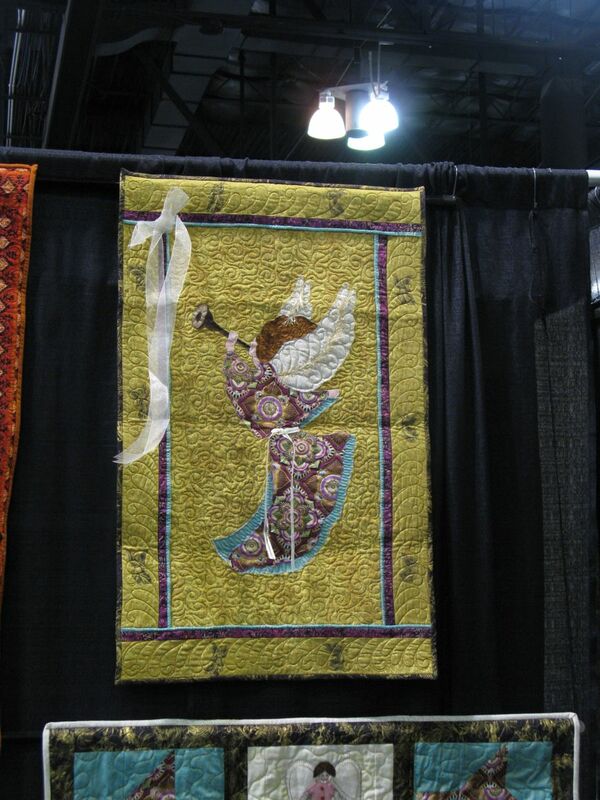 That’s why quilt shows are so valuable as they allow a viewer to fall in love with quilts again. 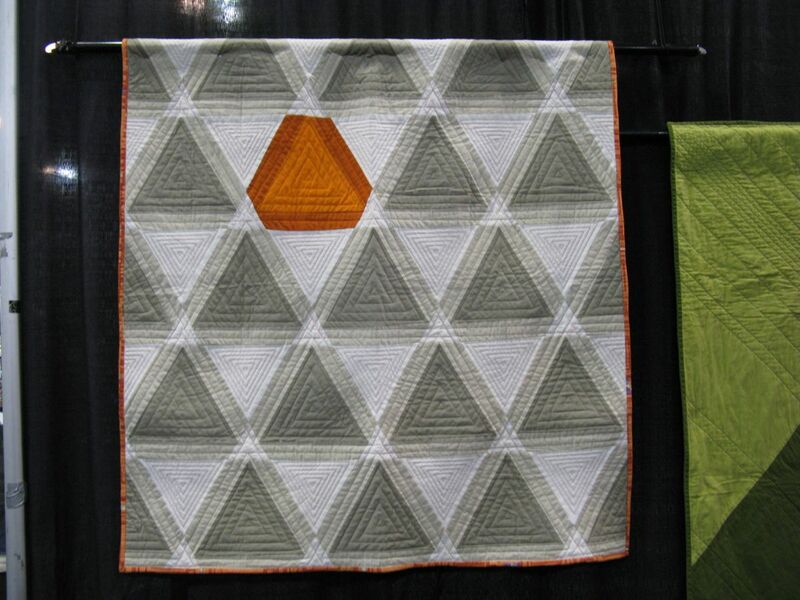 Likewise there were some quilts from QuiltCon. 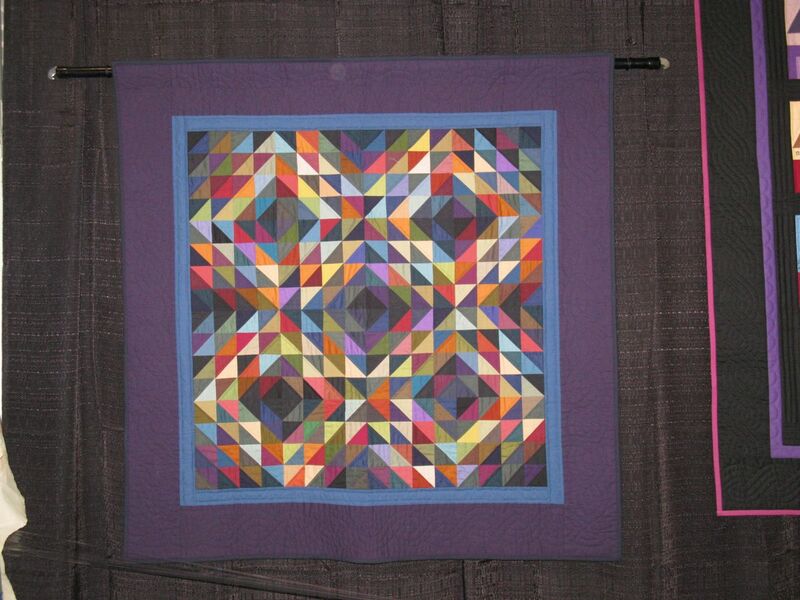 I took a shot of this one because I love Carolyn Friedlander’s fabrics, but it is true that this quilt is lacking some contrast. It’s not just the photography. 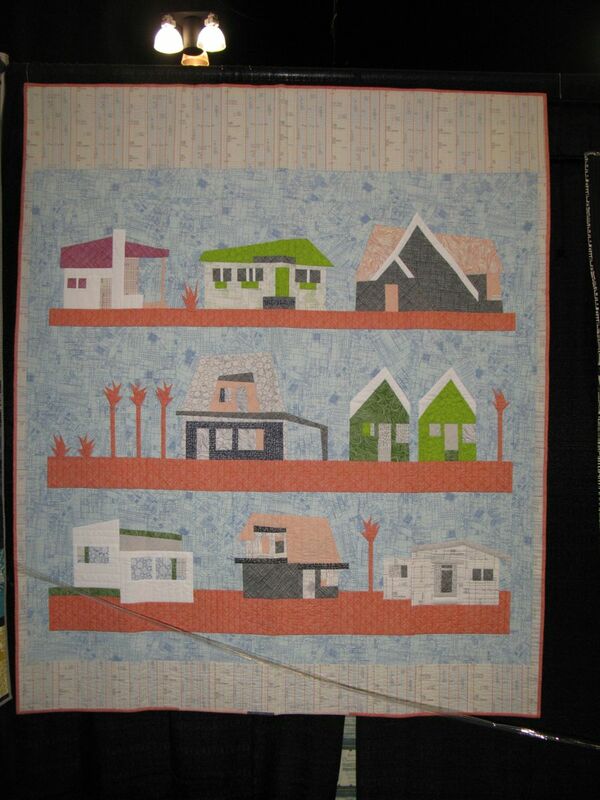 The title of this one is The Local Quilt. and lastly, A Very Long Conversation, by Rossie Hutchinson. 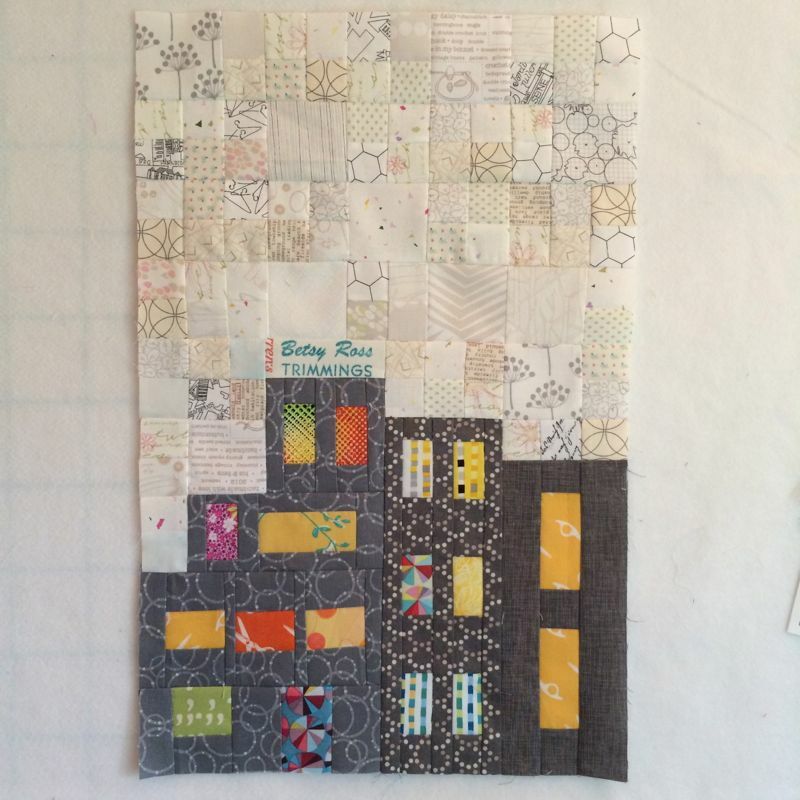 I was pretty sure I had a photo from Christa Watson’s String of Pearls (using Lizzy House’s fabric–a great design) but it’s too blurry to post, so go *here* to see that fun quilt. . . and her (more on that later). There were a couple of quilts I was sure I had a photo of, but when I looked at them, I must have been taking them on a fast run past. Maybe it was because I had too many bags around my shoulders? At this point, don’t you think we need a little retail therapy? 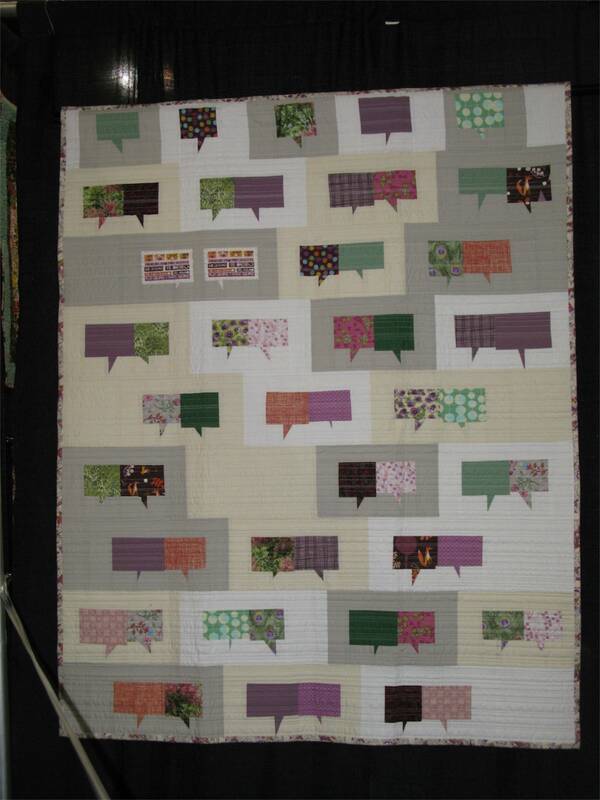 This is the little quilt in the charm booth–a way to display those little pins we all love. This group had figured out how to make earrings out of them, so they had a lot of people crowded around. 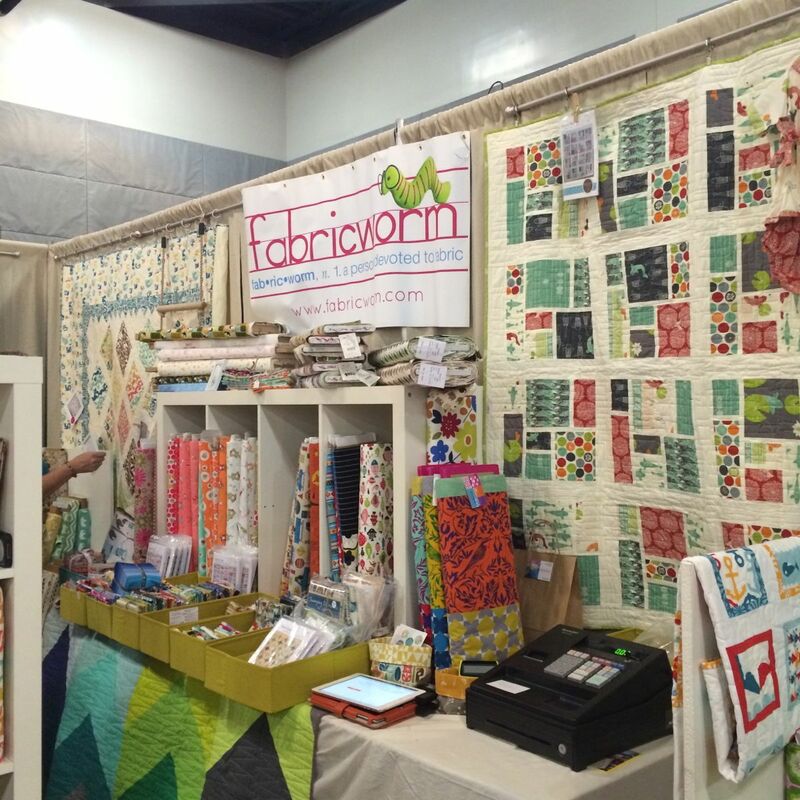 Fabricworm’s first time at Road. 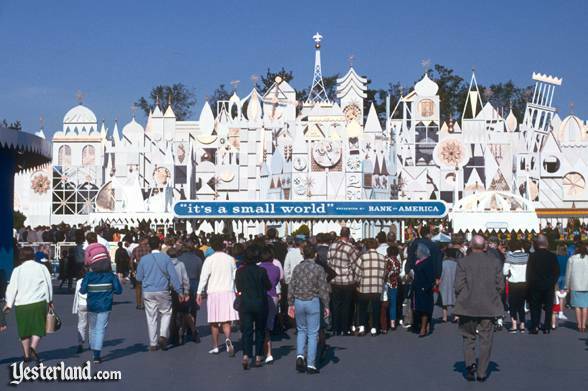 Judging from the crowd at their booth, I think they’ll be back. Loved the chair AND the floor mat. The floor “rug” looked like just patches with some sort of matte finish brushed over it. And LUNCH! 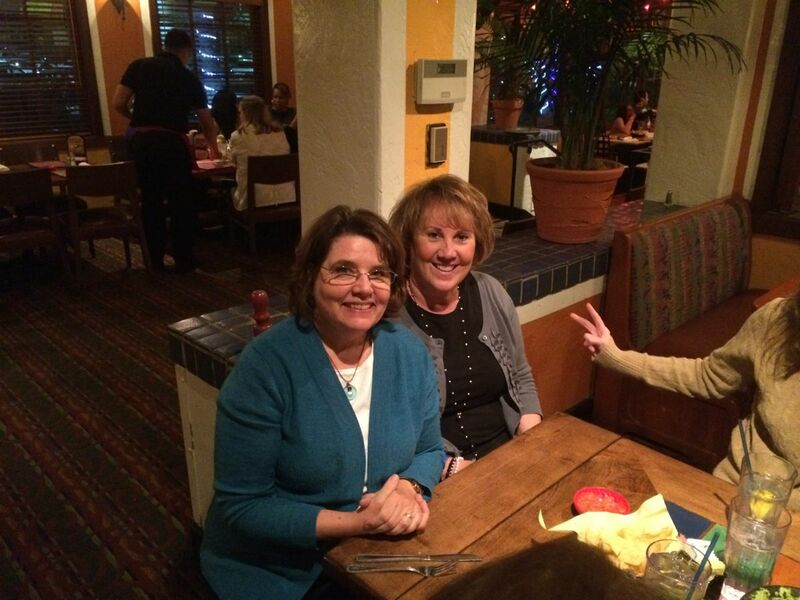 From left, Leisa, Lisa, Lisa’s sister-in-law Betty (who came from another state just for Road), me and Simone. 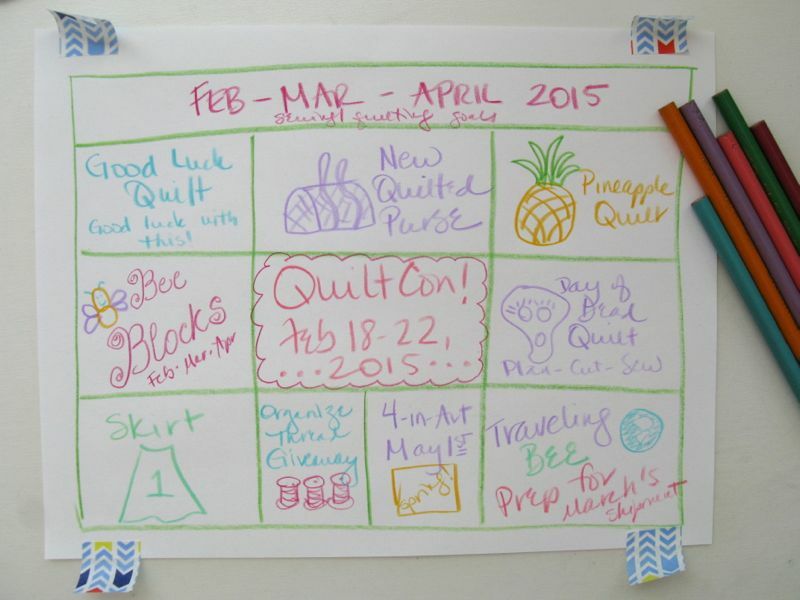 Get your scrolling fingers ready, here come more quilts! 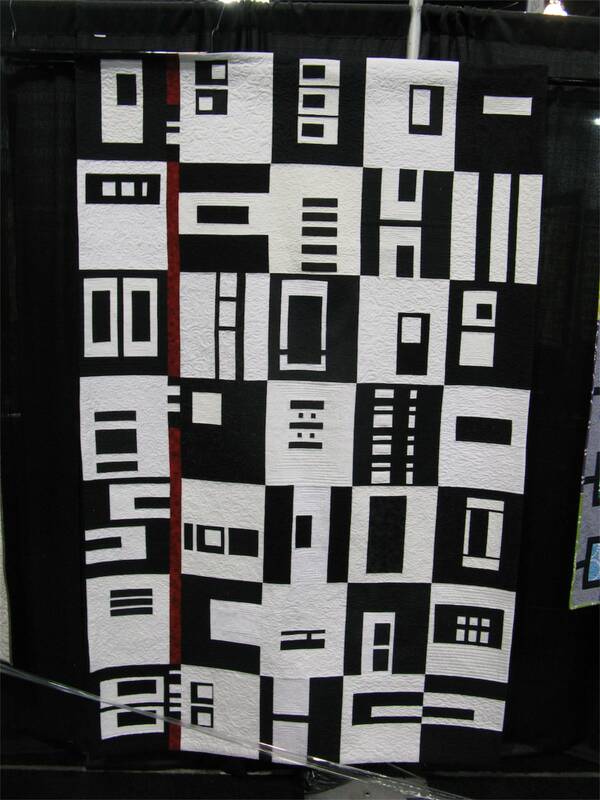 Janet Dorsey Hirth used lots of different piecing styles in her sampler quilt, titled Loose Leaf Earl Grey. 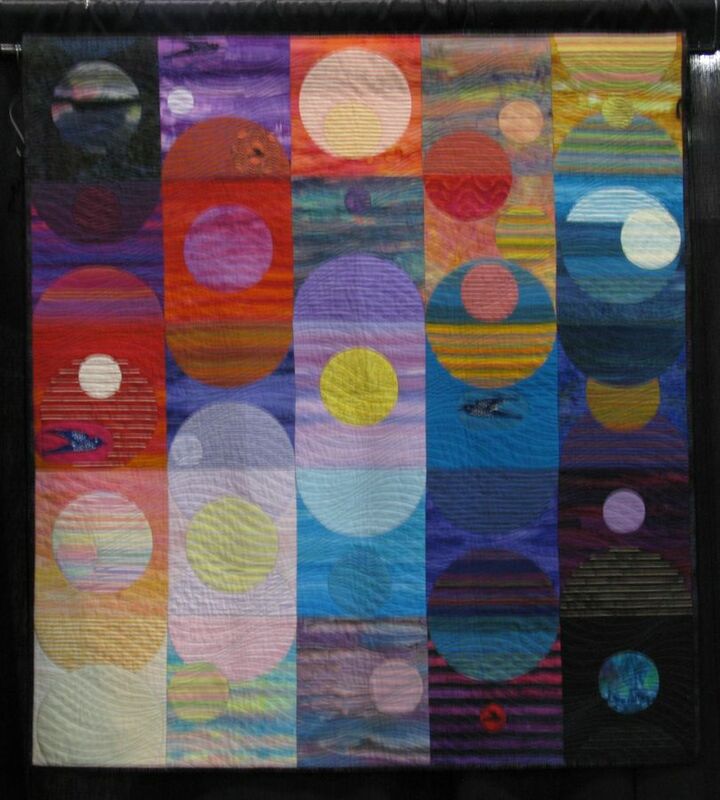 This is a terrible picture of a fabulous quilt, by Ann Feitelson, titled Music of the Spheres. Google it and you should find a better photo. It’s really amazing. 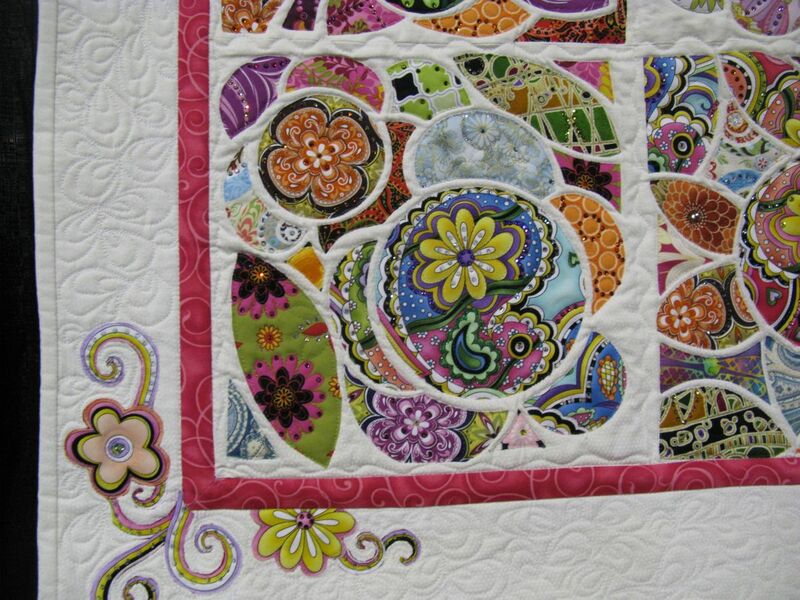 Kim Bruny’s Blast from the Past is so named because all the bright designs and paisley prints remind her of her childhood. Well, now we know how old she is! (Kidding, Kim. 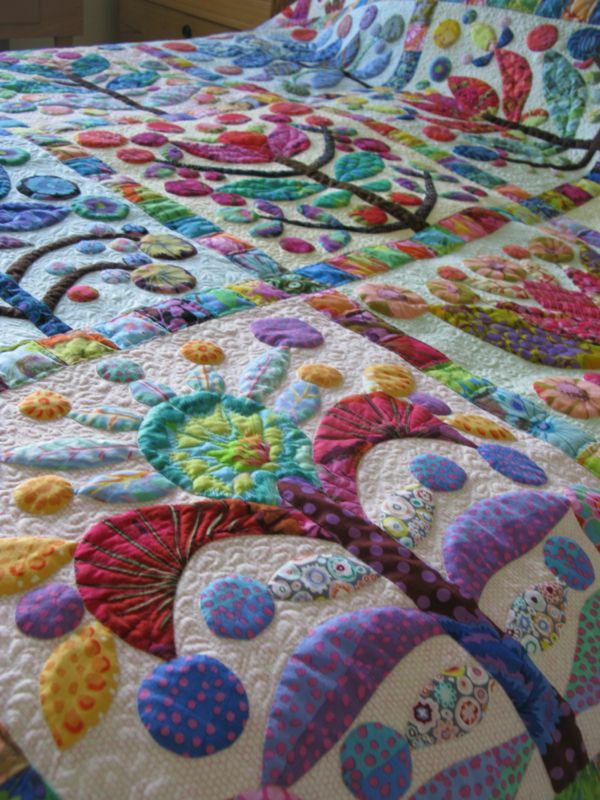 It was a terrific quilt.) I have several photos, showing details. 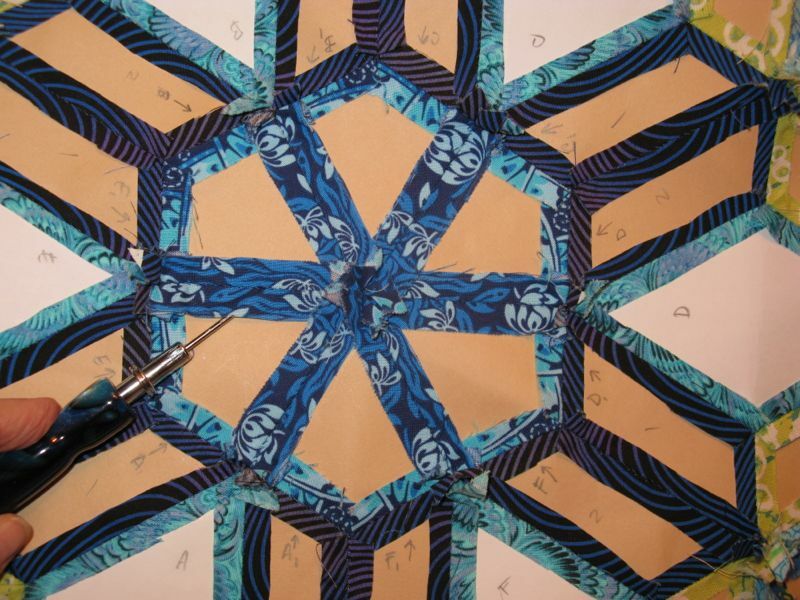 She used the “tiling” method of creating her top: appliquéing her patches to a single piece of fabric, keeping the pieces an even distance away, so it looks like tiles have been laid down. 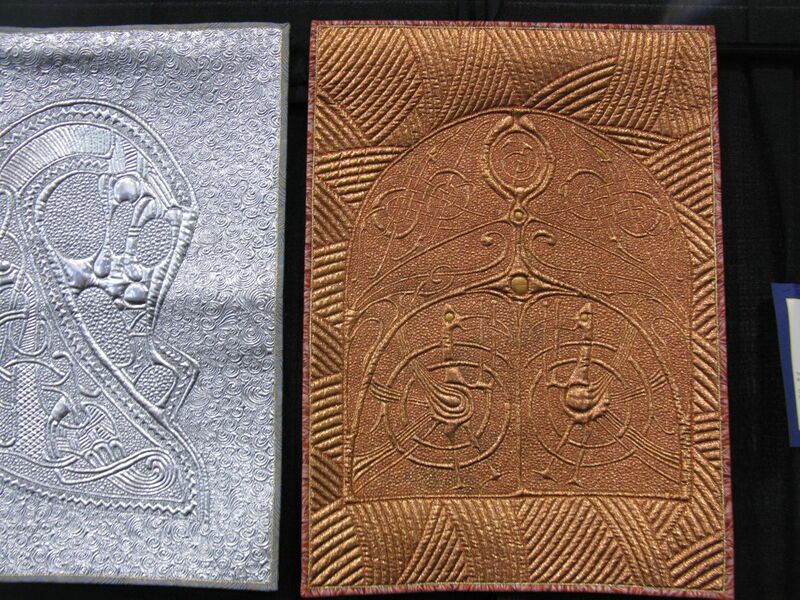 And in the borders–broderie perse, a technique of using specific cuts of the printed fabric to create the design. 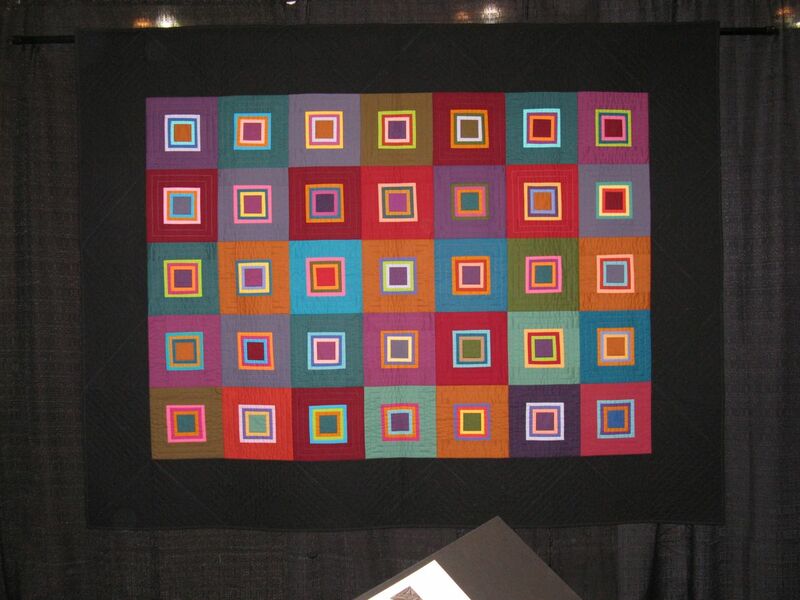 I liked this quilting because it wasn’t so dense. 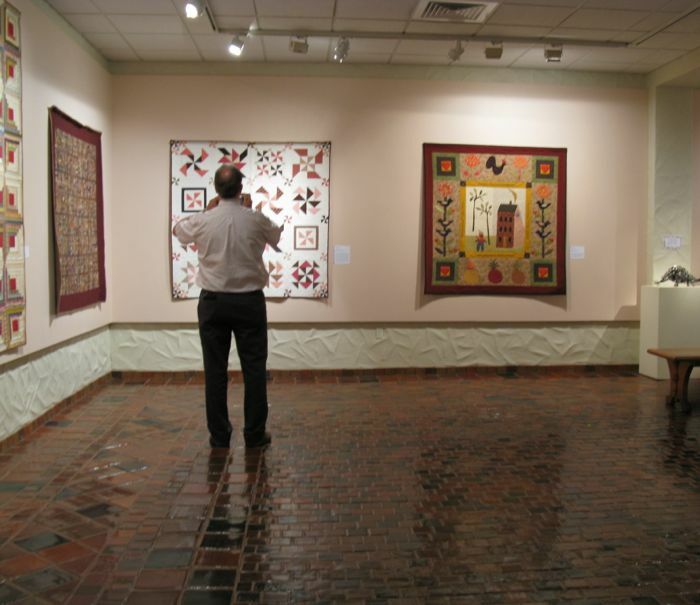 Lately quilters have been quilting their quilts so densely, they could stand up as a room screen by themselves. This is a nice change. 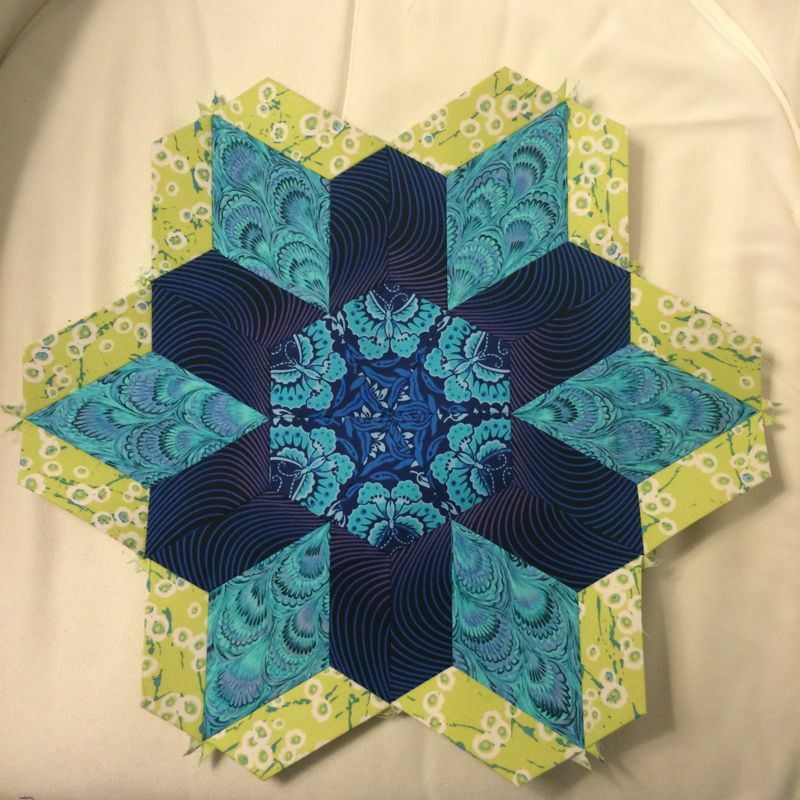 Sandi Delman’s Kartwheels was started in 2009, and took several raids of her fabric stash to make the rings, arcs, borders and stars. 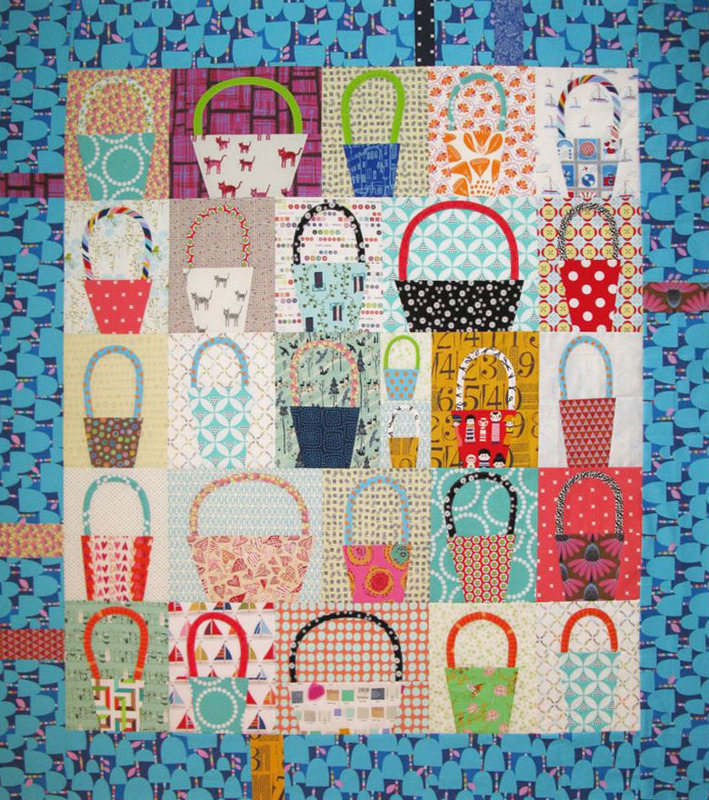 Kerry Marksbury quilted it. 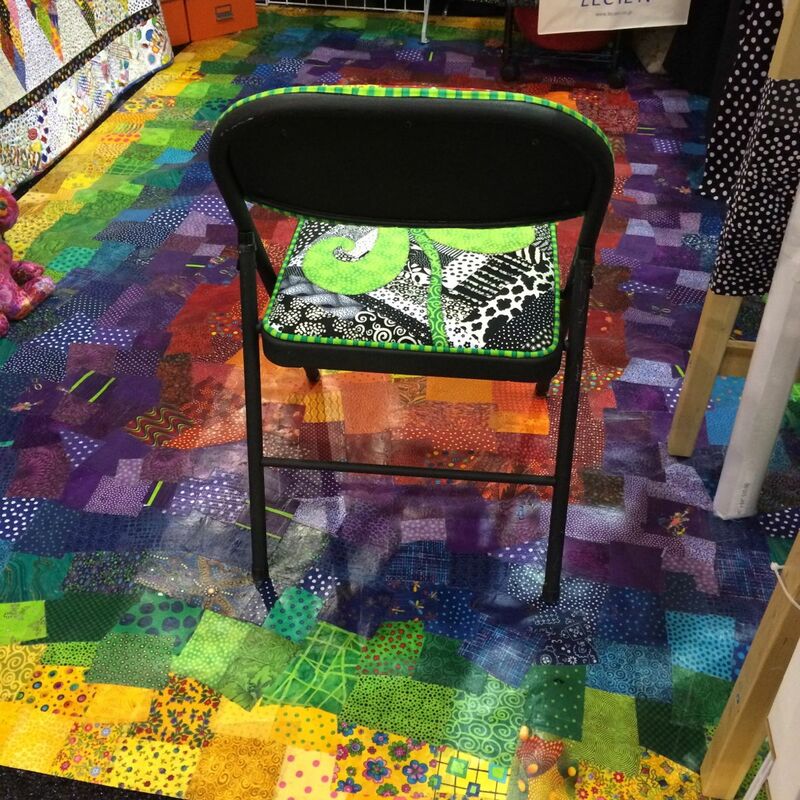 I spent the better part of Friday afternoon tearing back and forth between the Superior Thread Booth and the booth where my quilter Cathy Kreter was working, talking about threads, designs, colors, etc. 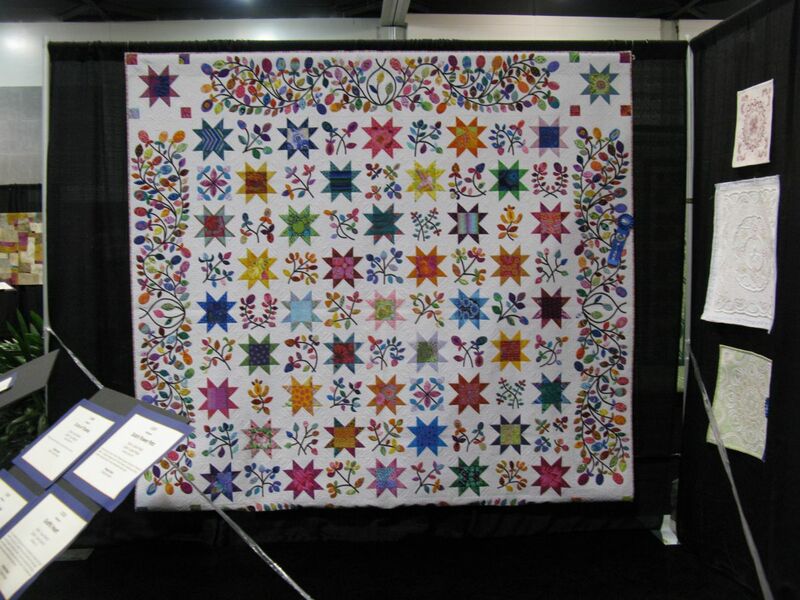 I was successful in choosing a thread, and on the way back, I stopped by Nancy Rink’s booth to show her my quilt (she designed this quilt). She obliged me with a photo. Yes, I carried that king-sized quilt top around all afternoon (which may account for some of the blurry photos). A few went back home to our town, and those of us who were staying the night gathered together in mine and Leisa’s room, did Show and Tell and talked shop. I’m not letting those others go home next year, and think we ought to order in some chocolate cake and ice cream for fun. 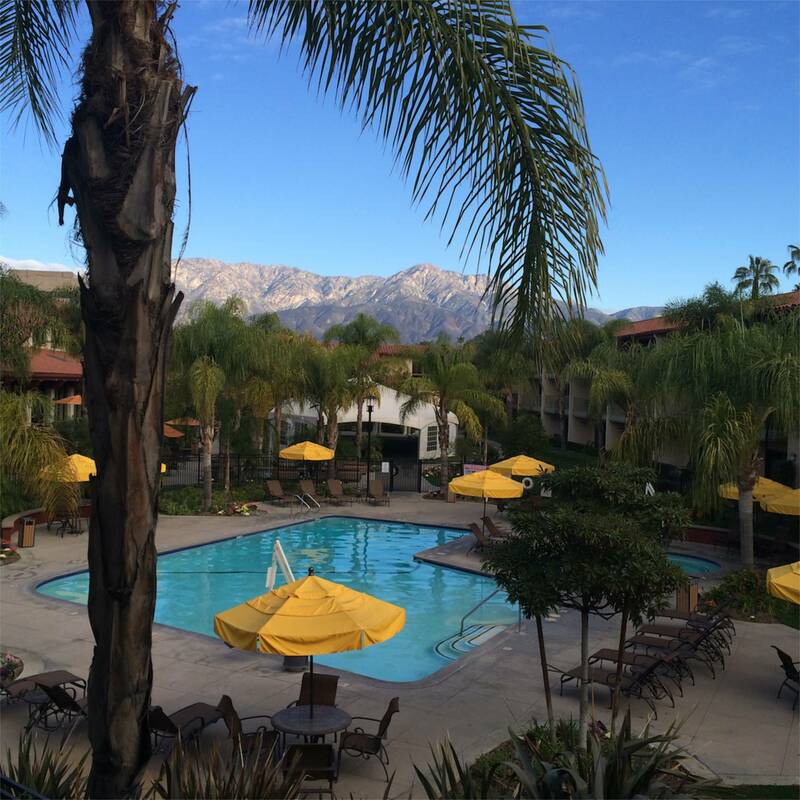 You’ll hear us Southern Californians complain about our drought (those mountains ought to have WHITE tops, not brown), but you can’t beat waking up to this on a January morning. We’re in for a doozy this summer in terms of water rationing. Expect me to come and see you for a shower this summer. Okay, last batch of quilts. Here we go. 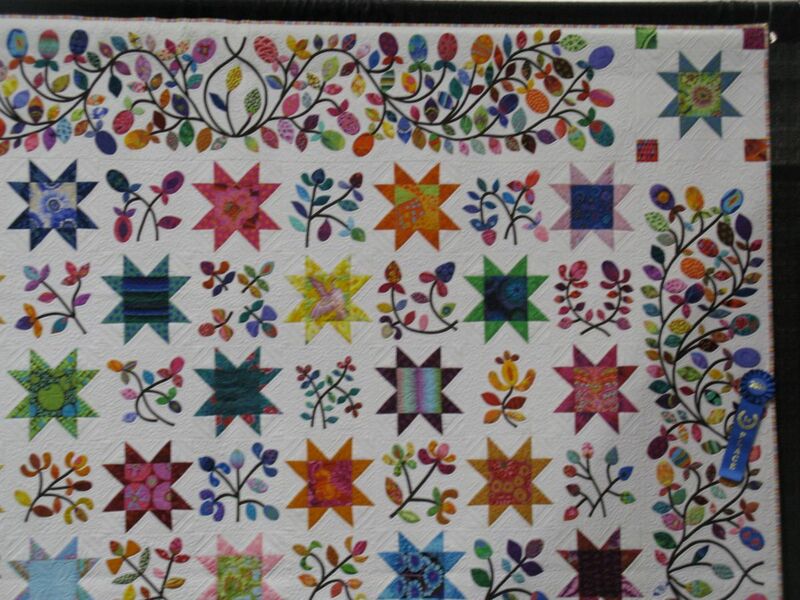 Pat Adair’s Joyful Giddiness used a few of Kim McClean’s patterns to create the appliqué in this quilt. 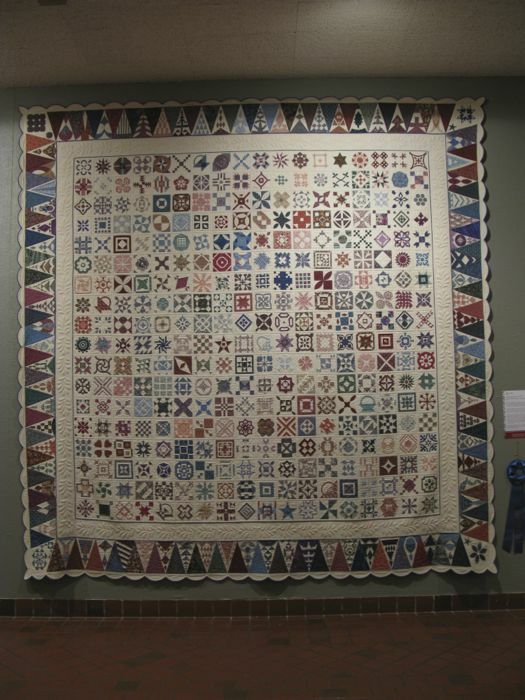 A lovely quilt, as evidenced by the use of color, piecing and quilting (and that blue ribbon!). 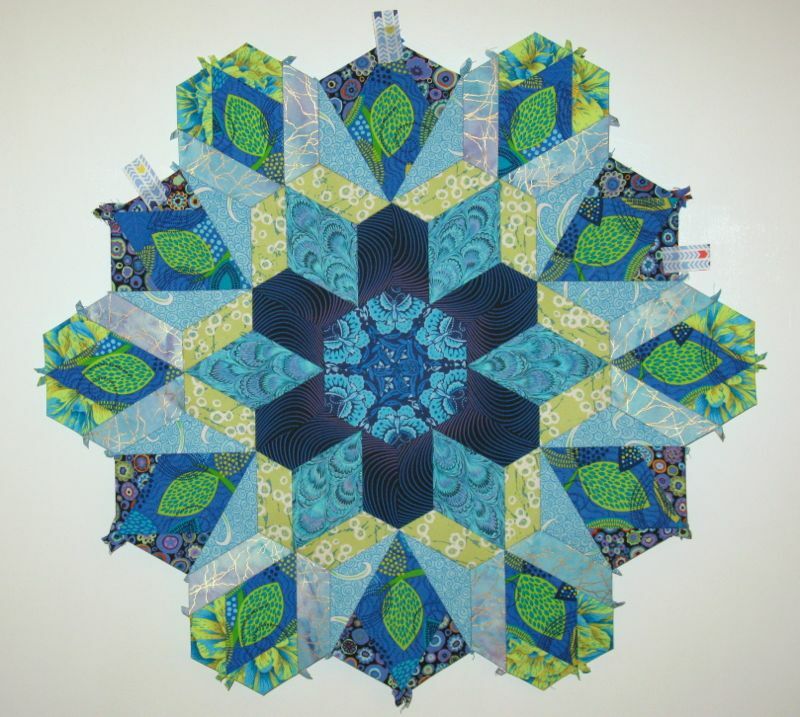 Almost Symmetry, by Nicki Allen (quilted by Kathy Gray). 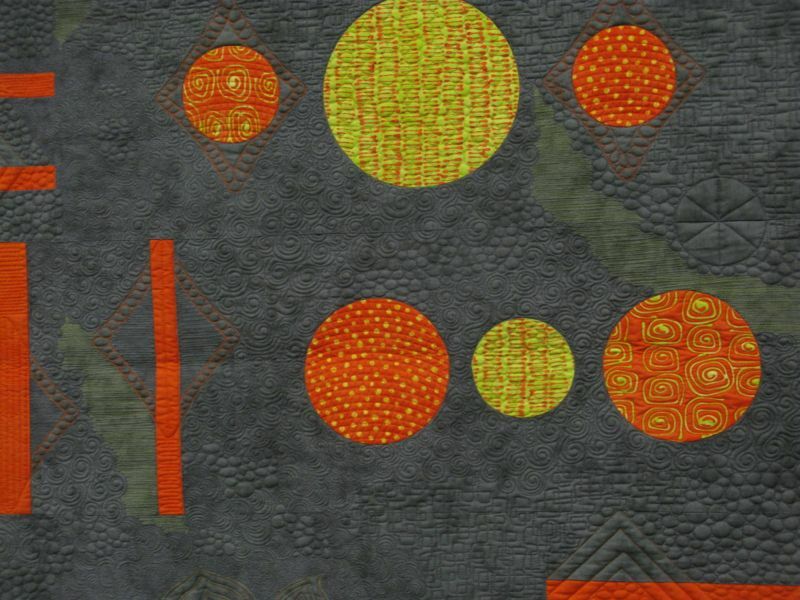 This was made for the EZ Dresden Quilt Challenge, an online challenge sponsored by the Salt Lake Modern Quilt Guild. 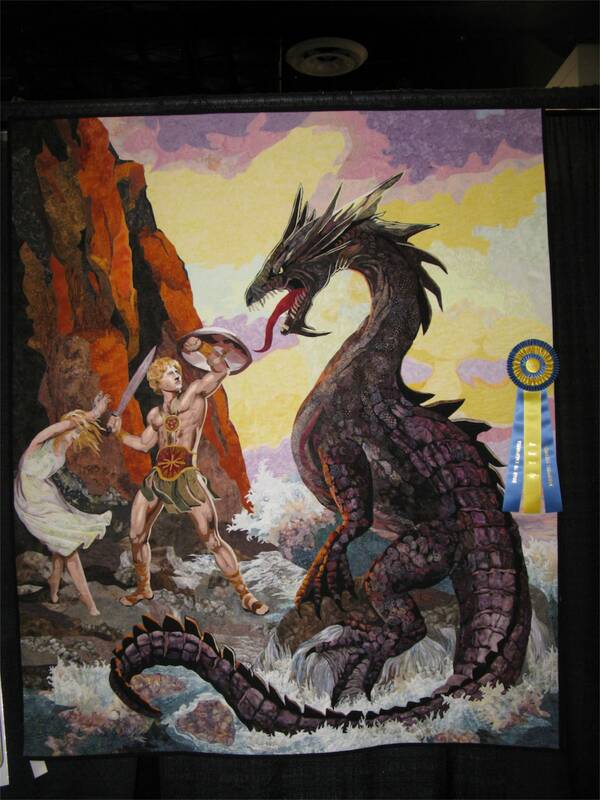 Marilyn Belford used all varieties of fabrics and techniques to create this masterpiece titled Perseus Saving Andromeda. 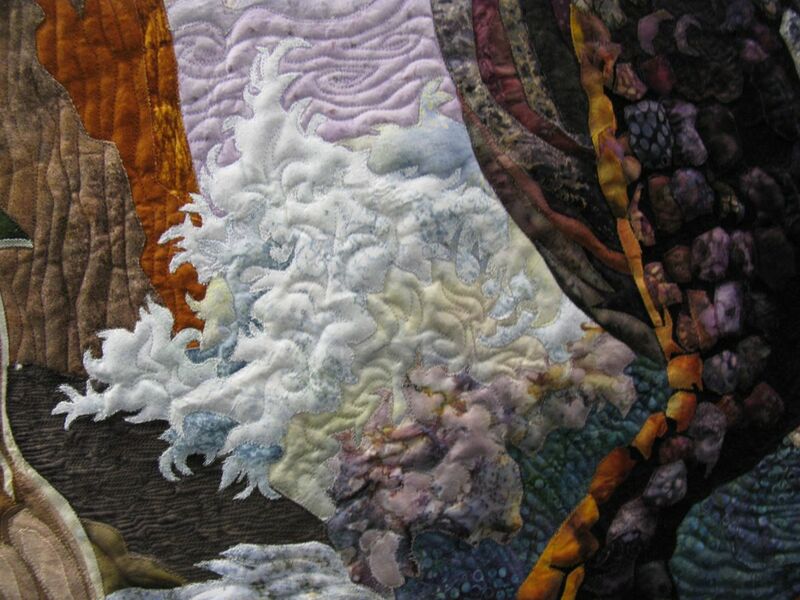 That rough water is raw-edge appliquéd, as is most of the quilt. 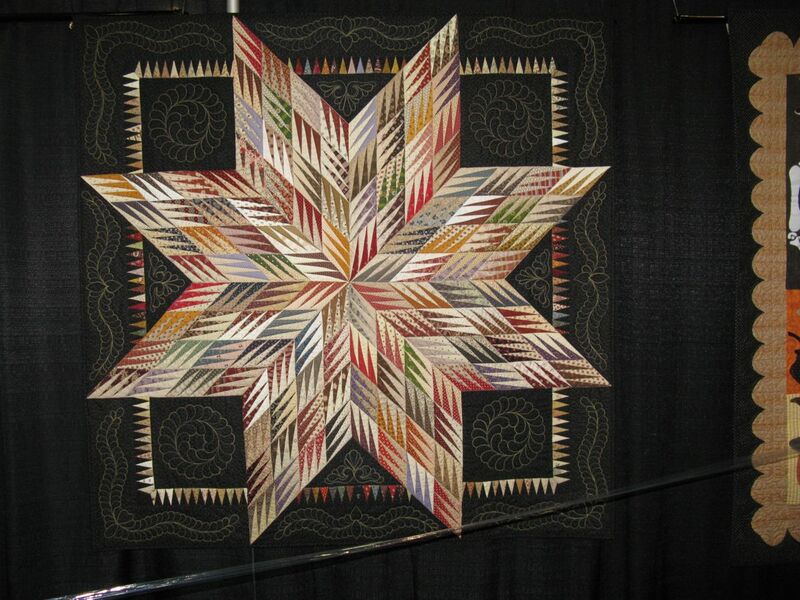 Fractured Star was made by Linda Bergmann and quilted by Debbie Lopez, and is a Karen Stone design. 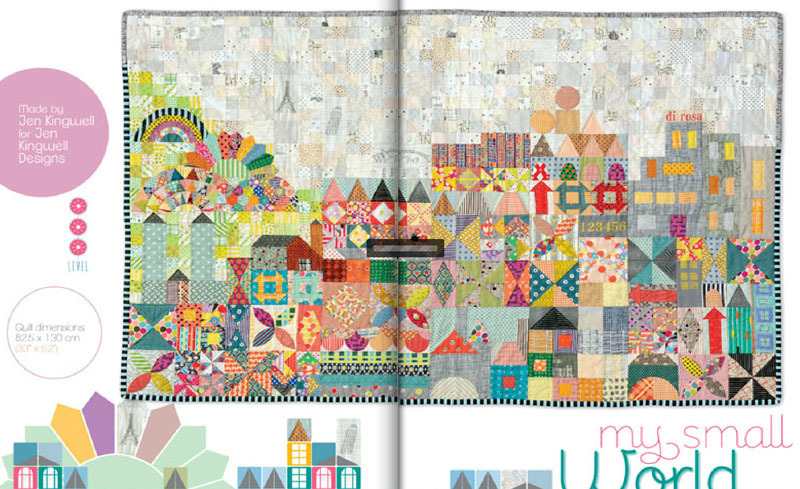 So is Susan Bianchi’s Graffiti Heart a quilt? 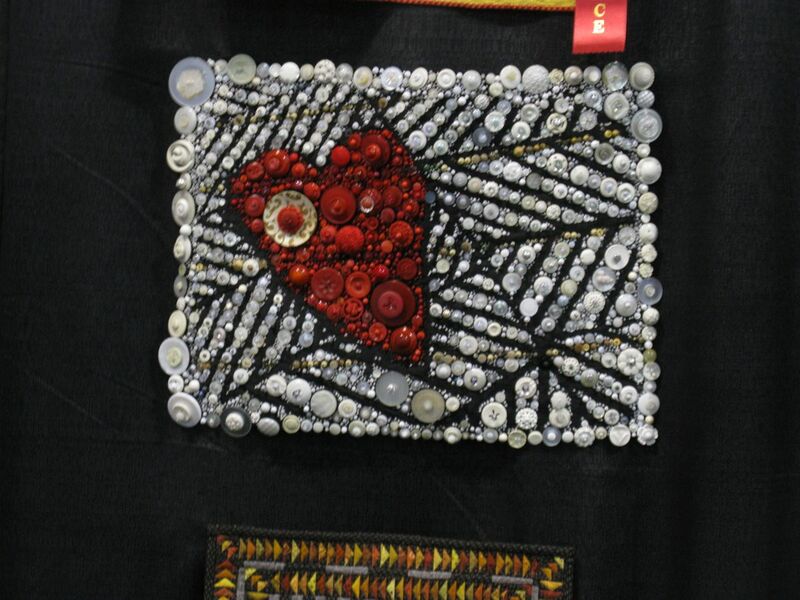 Since she created her design out of beads and buttons on whole cloth? 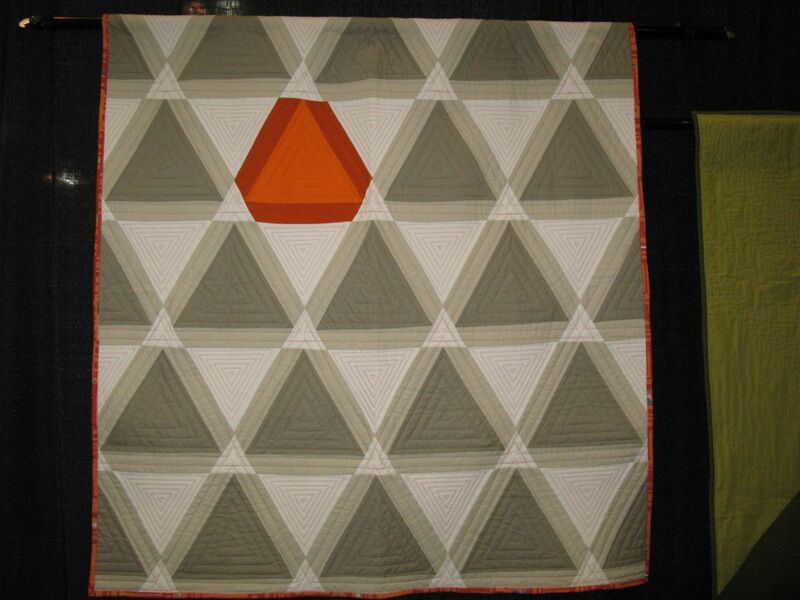 I remember that controversy came up with Hollis Chatelein first debuted at Houston, with her whole-cloth painted quilts. 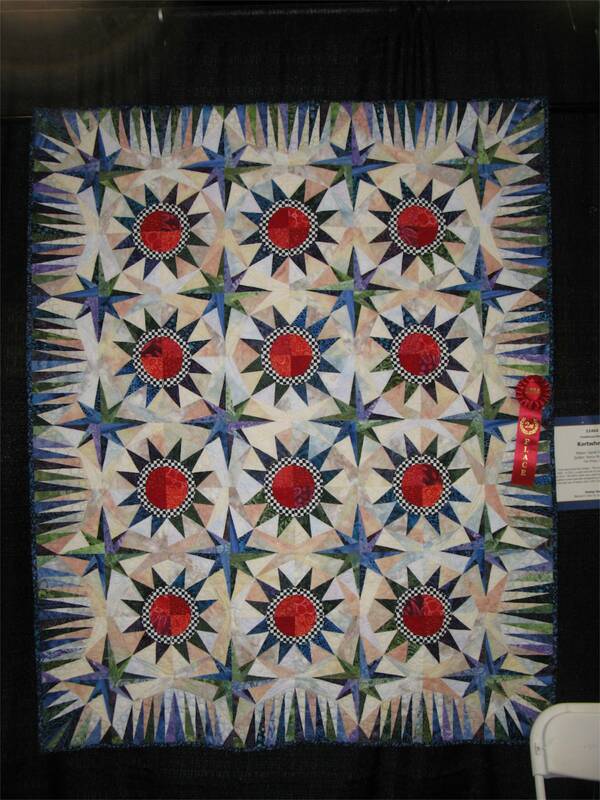 (She earned a blue ribbon that year.) 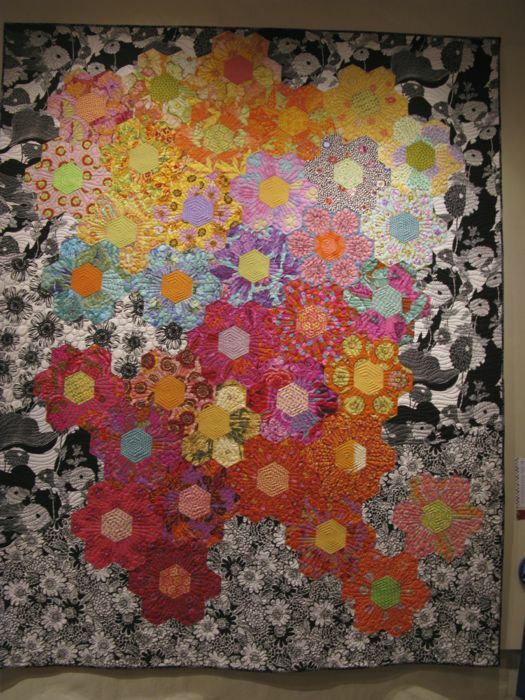 Whatever, this was one of two of these button/bead quilts in the show, fascinating collages utilizing hard surface design. 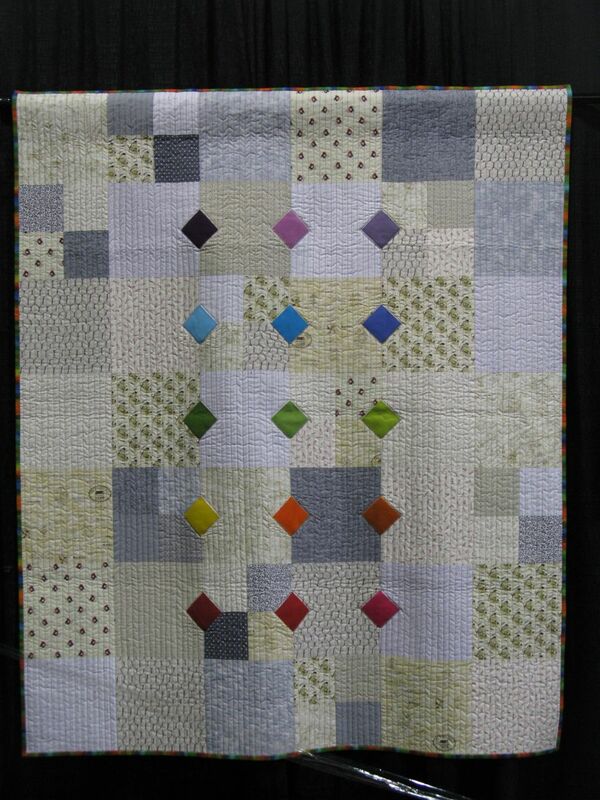 And now it’s time for the Ugly Quilt Award. 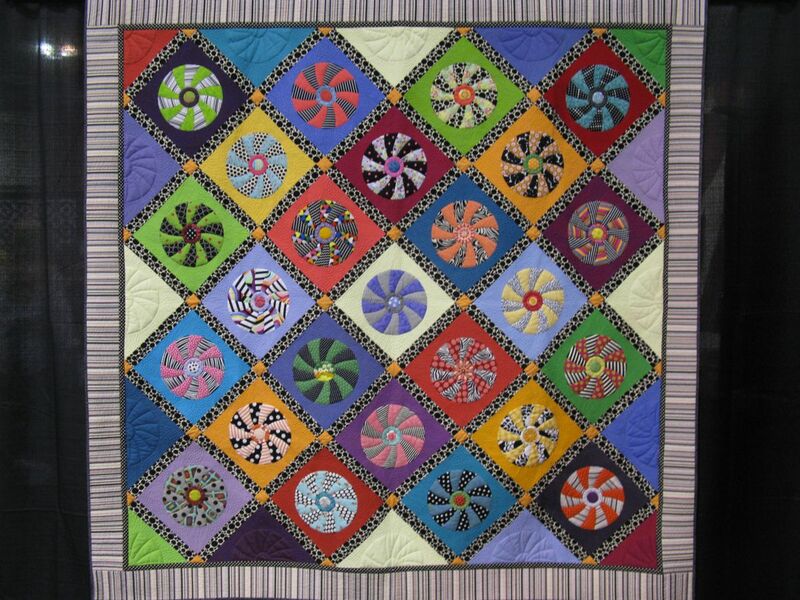 Every year I try to pick the ugliest quilt. 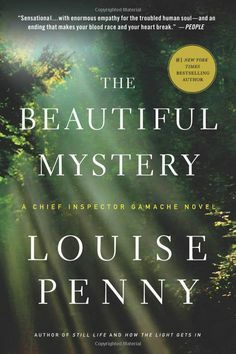 It could miss on overall composition, surface design treatment, overreaching in the skill department (think: Peter Principle), or by the fact that somehow, it was just plain. And ugly. 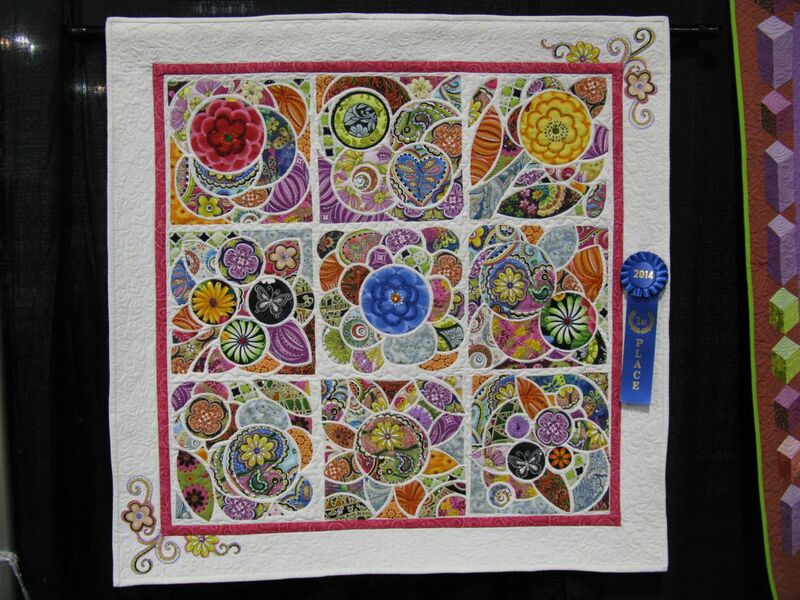 A very subjective category, but in walking around with some of my quilter friends, a number of them pointed out candidates for this award, so I know it wasn’t just me. All of these are nameless, maker-less. And in full-disclosure, any one of us could in any given year qualify, so no hubris intended. From the plastic doll, to the overly busy background to the tassels, andthat 3D hair, this is a sure qualifier. 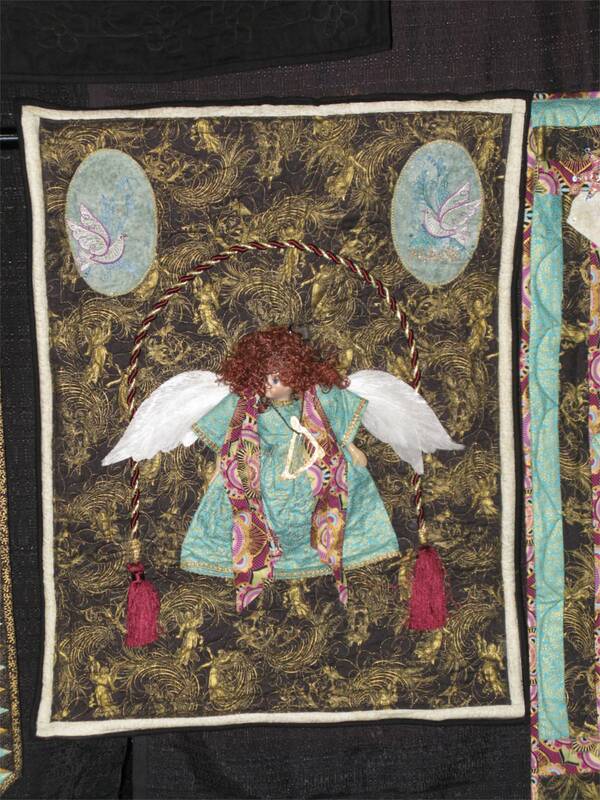 Another angel candidate, with her strangely proportioned torso to that gift-wrapped bow on the corner. Hmmm. Meant to evoke a haunting response from the viewer, of the souls of lost native Americans now inhabiting the abandoned-dwellings-now-a-National-Park (I suppose) instead this just came off as creepy-looking, kind of like a cartoonish dead baby head filling a sacred space. 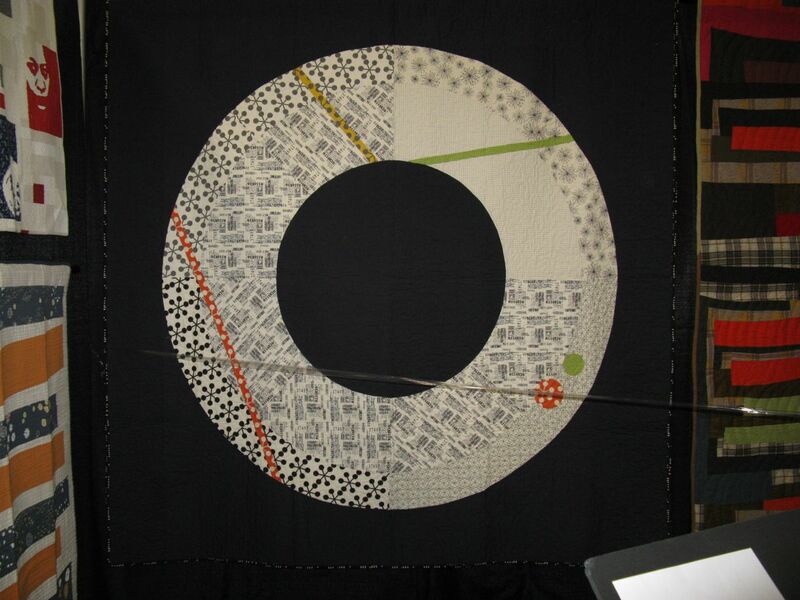 Update: While I originally noted the fine quality of the quilting and the good design and composition of space, I panned this quilt for the drawings, as they looked extremely juvenile. 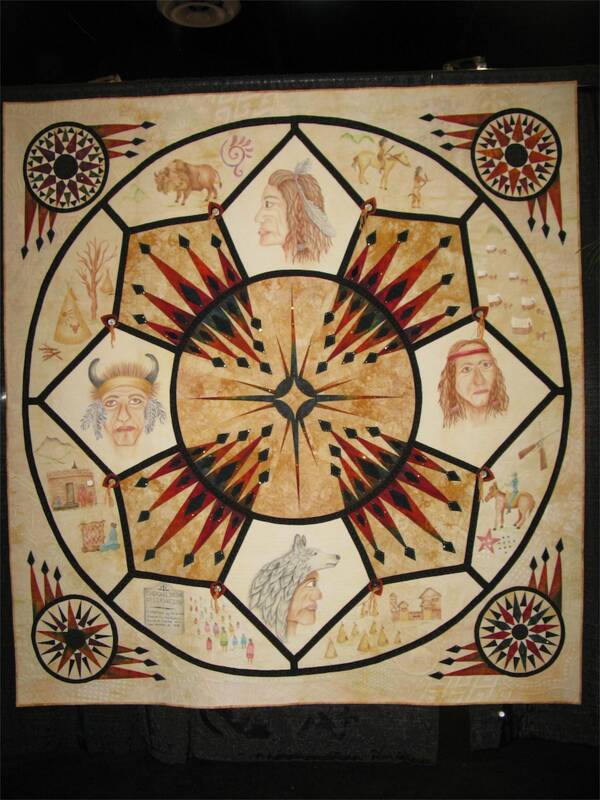 My sister, the historian, called me tonight to tell me that she thinks they were based on well-known (to historians) primitive drawings done by Native Americans at some of the critical battles. She’ll let me know the source, and then I’ll add it here. 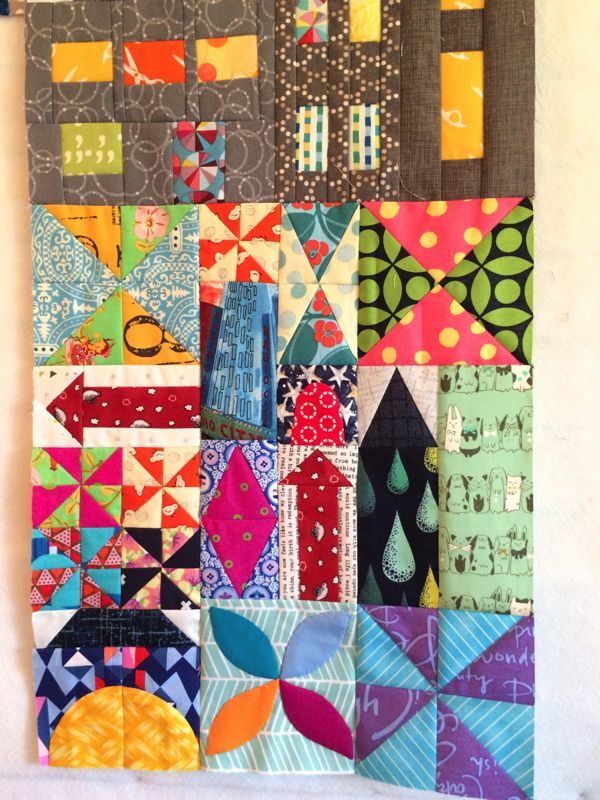 Okay, Ugly Quilt Contest over. 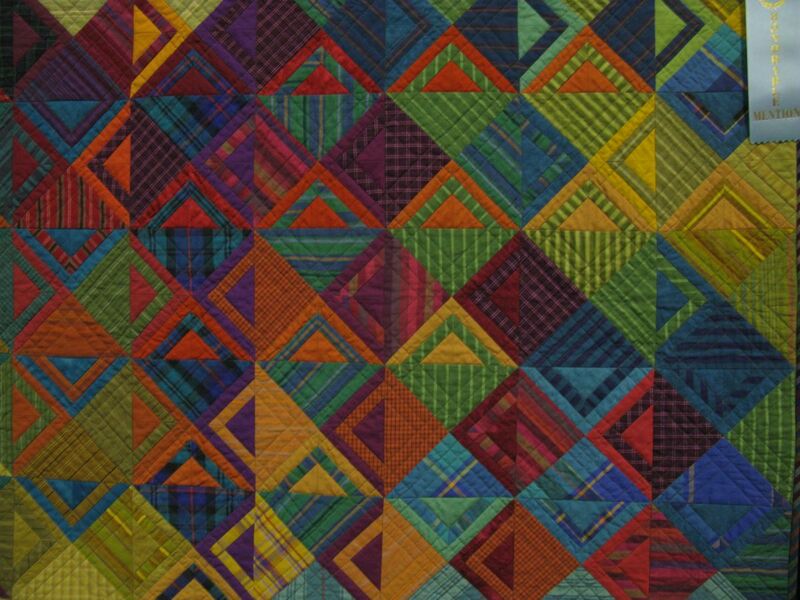 Later on I’ll show you my favorite quilt, and I’ll tell you why. (The ones I love usually never win at this show. But I was happy to see this week that one of my favorites from last year went on to Win Big at other national contests.) 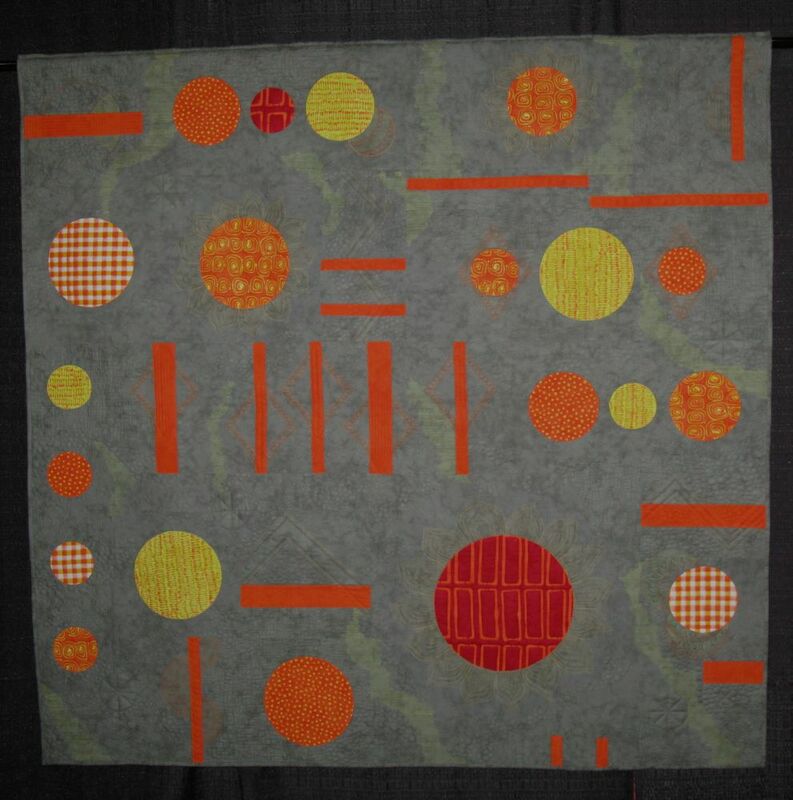 Okay, back to the quilts. 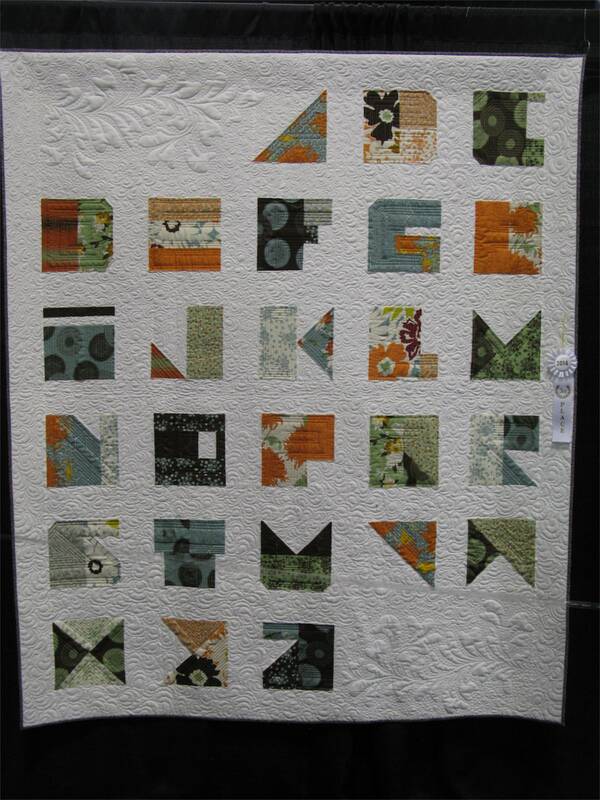 Modern Alphabet, made and quilted by Gerrie Thompson. 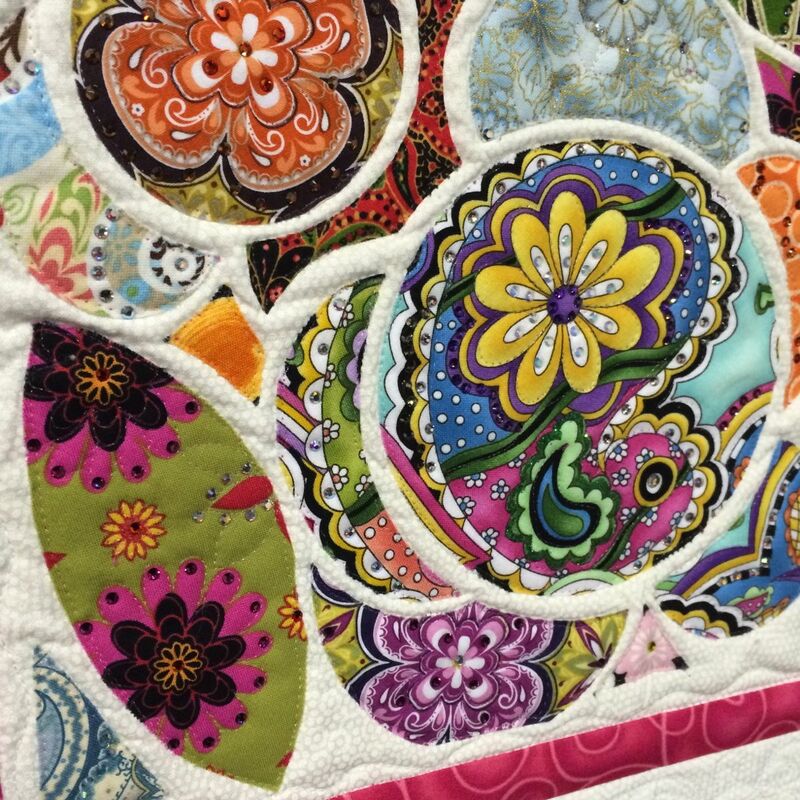 Yep, I’m pretty much fixated on DSM quilting this year. My apologies. 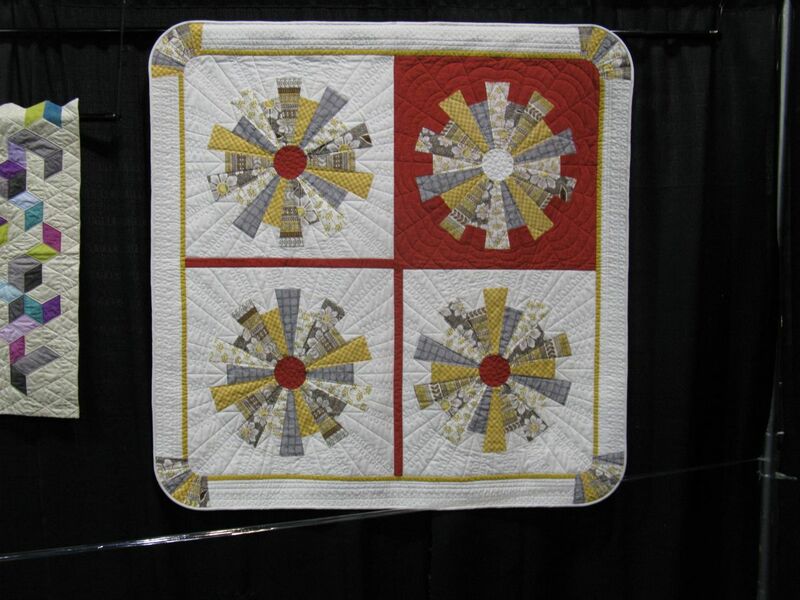 Patricia Wolfe titled her innovation of a traditional Bear Paw block KABOOM! Bear Paws Gone Wild. 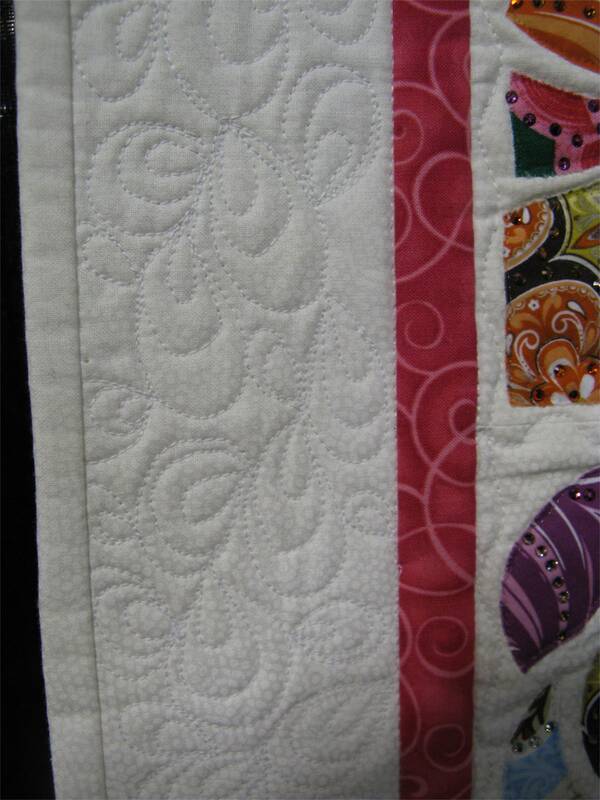 She also quilted it herself. 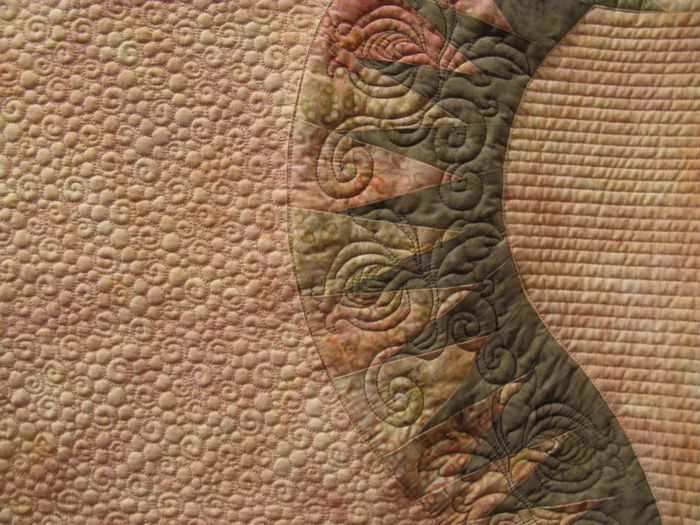 Titled Mishief Maker, Sue Wilson both made and quilted this octopus quilt, hand-painting the design on linen. 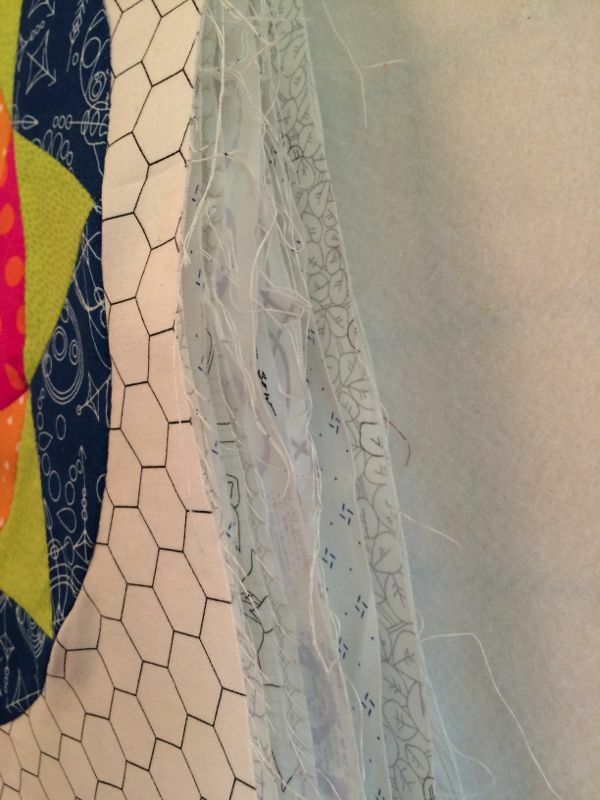 I walked around with my friend Simone and she gave me a lesson on borders, and why are quilters so attached to their borders? 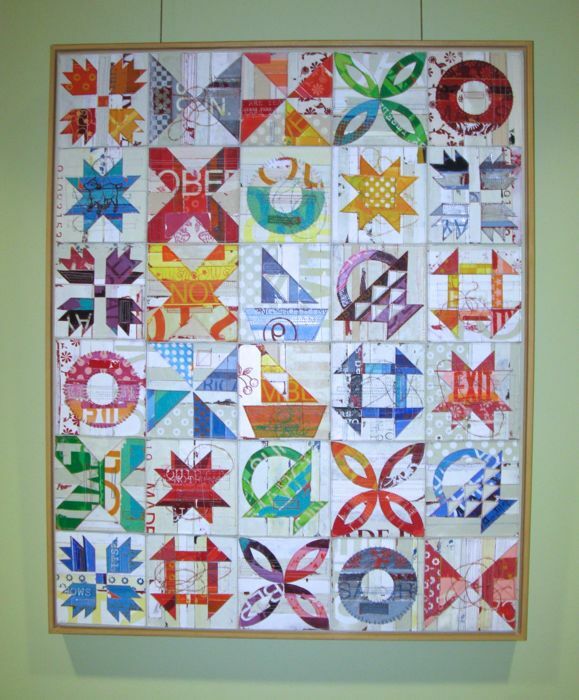 As a trained graphic artist, she showed me several quilts that would have benefitted from “breaking the borders,” as the traditional use of that space enclosing a design cramped the artistry of the quilt. This was a successful breaking of the border, she noted. We both loved it. LUNCH! 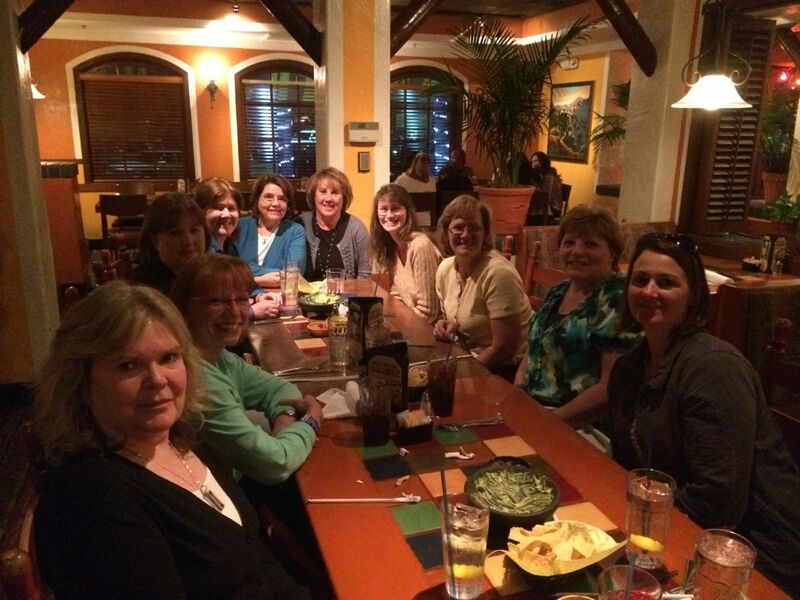 (Day Two) with Cindy, Deborah, me, Leisa and Christa of ChristaQuilts. 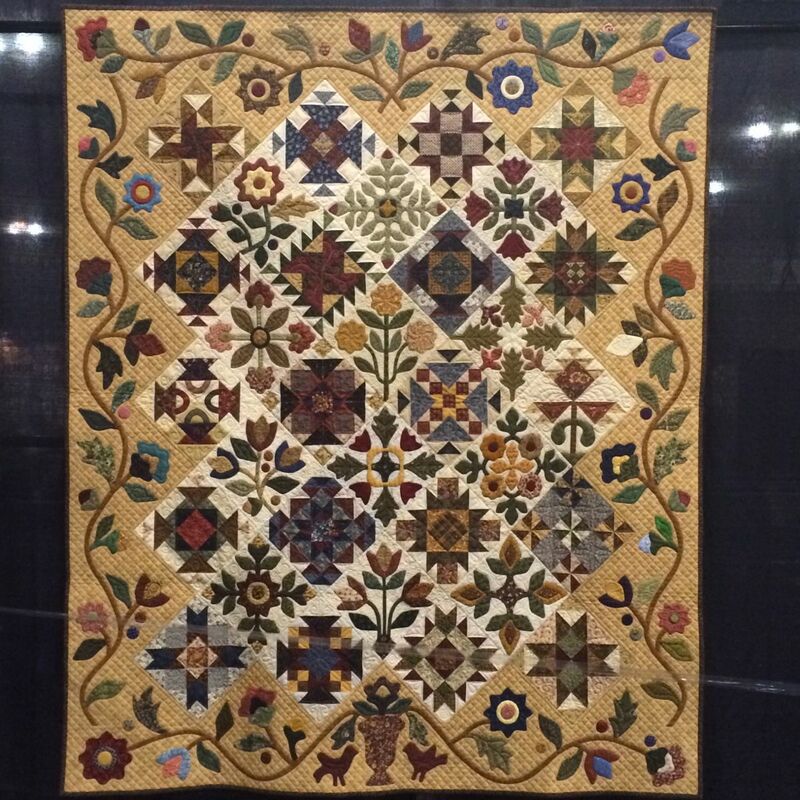 It was a great conversation about quilting, the industry, design, breaking news and old news, one of the advantages of getting together at a quilt show. 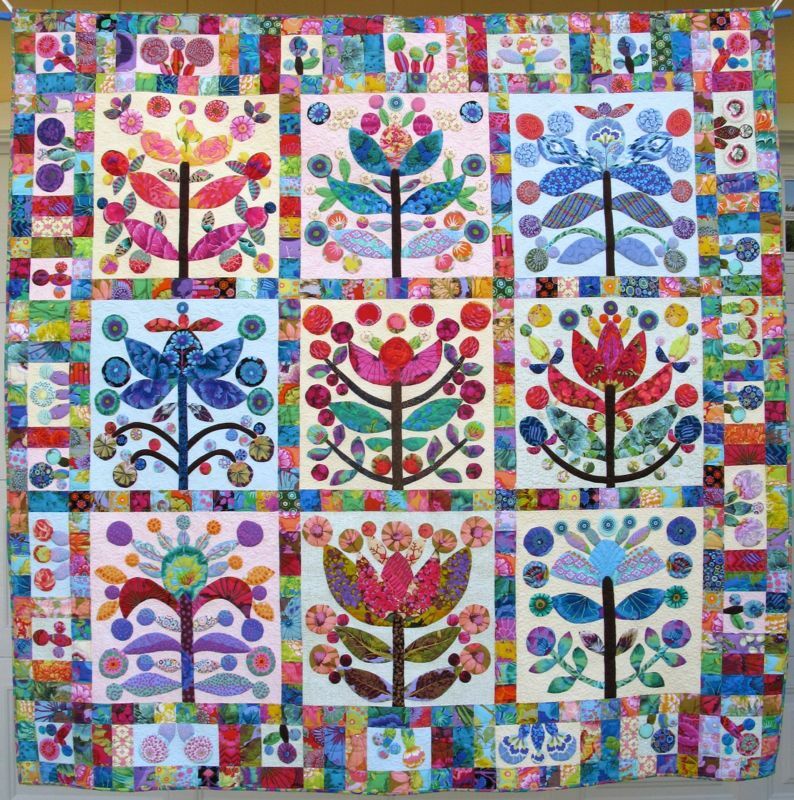 Okay, last gasp of quilts, then my favorite. 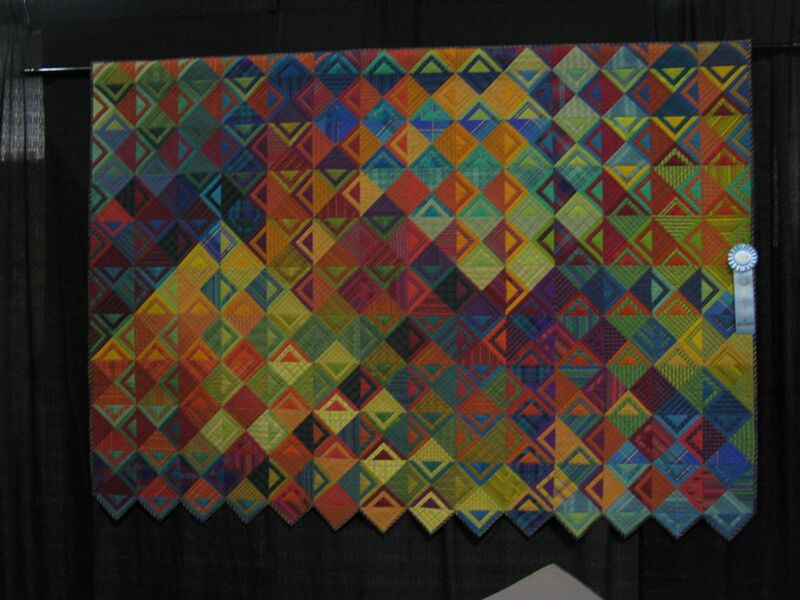 One of a trio of quilts, Linzi Upton’s quilts were tucked away at the back of the hall. 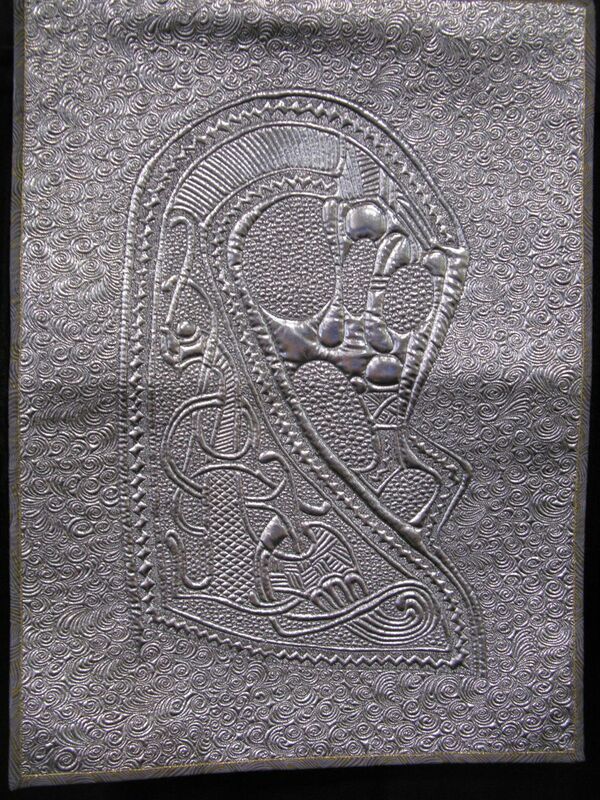 Another quilt, Silver Madonna won big last year, and these look like they follow in the same trend of using metallic fabric, then painting it, then quilting it to achieve the texture. 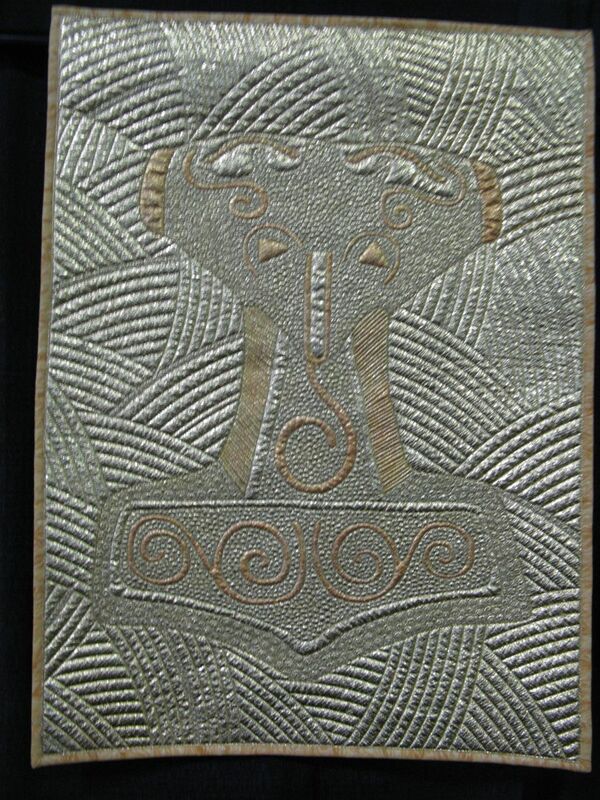 The title of the three together is Odin’s Triology, and Upton made and quilted them all. Inspired by the Holyoke Range and the Connecticut rivers near her home, Timna Tarr created Valley Snapshots, a rich mix of shape and color. This was almost my most favorite. 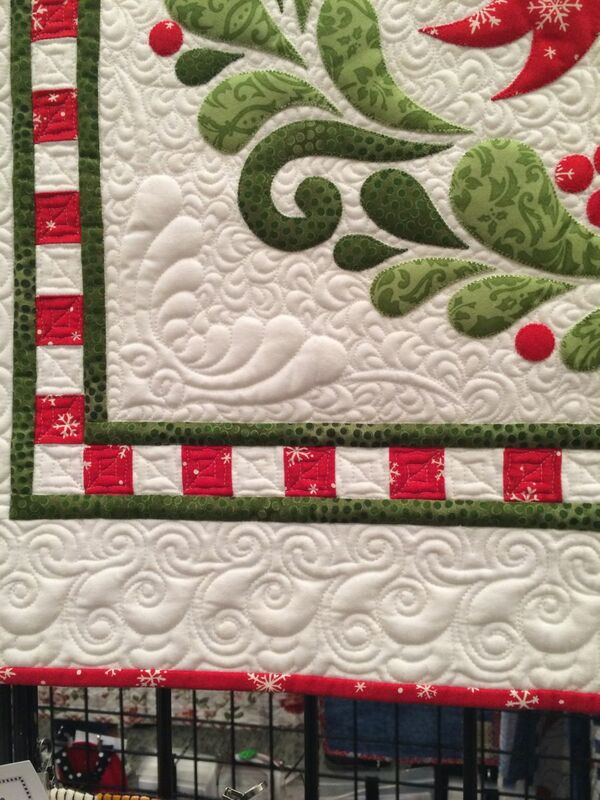 I had to show you close-ups of the quilting. Citrus Slices by Marie O’Kelley was dear to my heart, as we live near the Citrus Experimental Station of the University of California–Riverside. 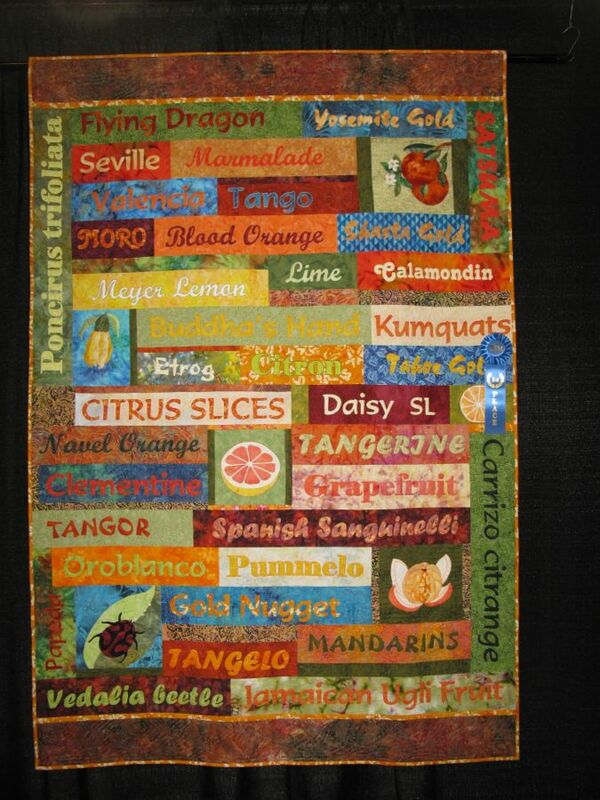 She writes “This quilt commemorates my brother’s career at UCR hybridizing new citrus varieties. Included are the names of his hybrids and those of more common citrus types.” By the way, if you like the little easy-to-peel Cutie (brand) tangerines, you have the scientists at UCR to thank. 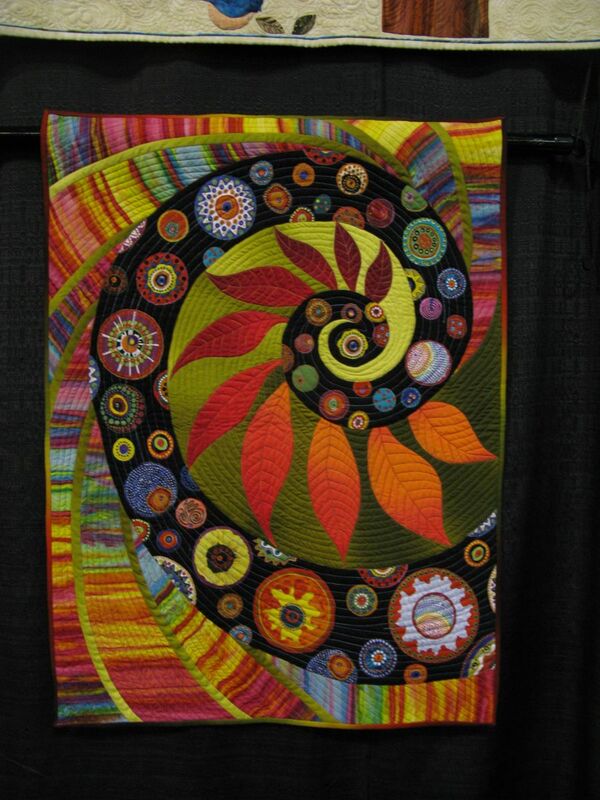 Autumn Whirlpool, by Bobbie Moon. 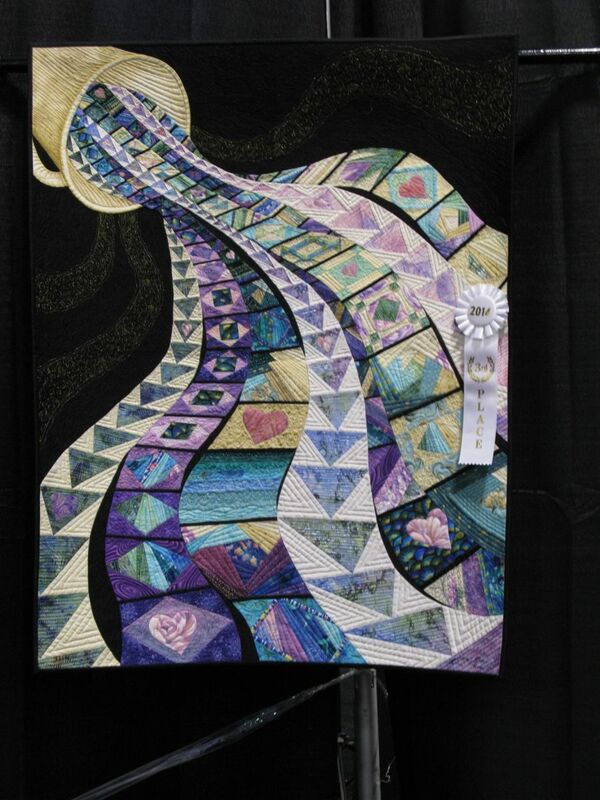 And now my favorite quilt of the show. 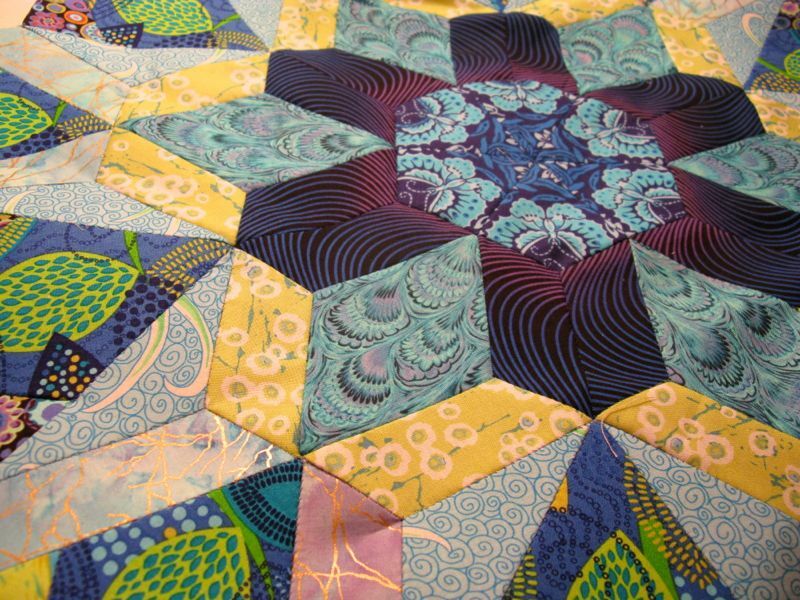 It’s not flashy, overly huge, stylized with 300 pounds of crystals and bling, but it’s a perfectly executed gem of a quilt. 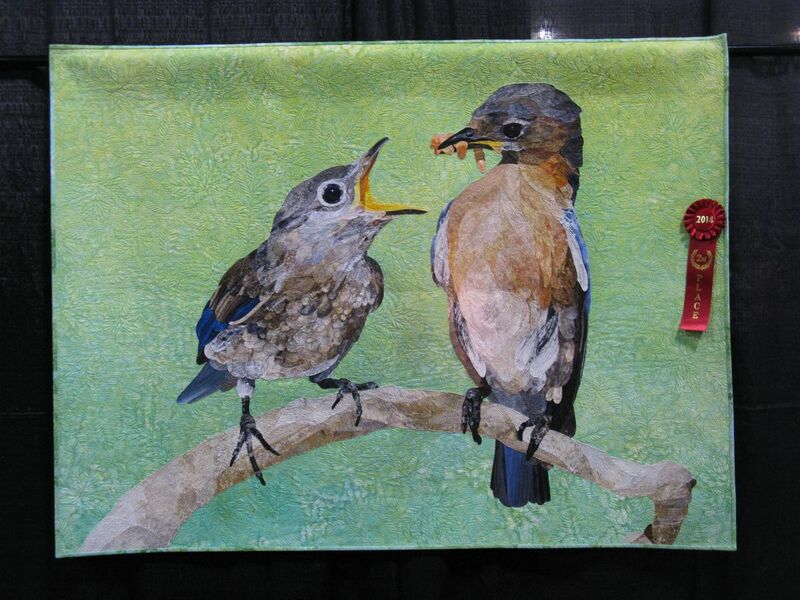 Titled, Did You Wash Your Beak, it comes from a nature photograph of Eastern Bluebirds by Steve Byland. 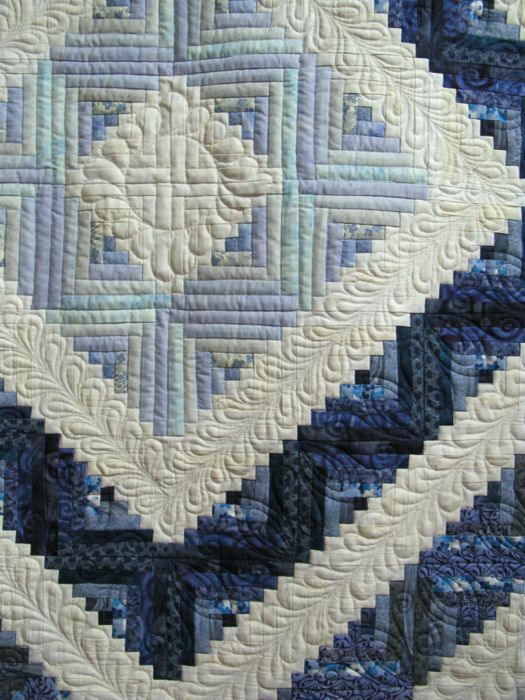 The quilting appeared to be in a heavier weight variegated thread, which shows every flaw. I couldn’t find any. 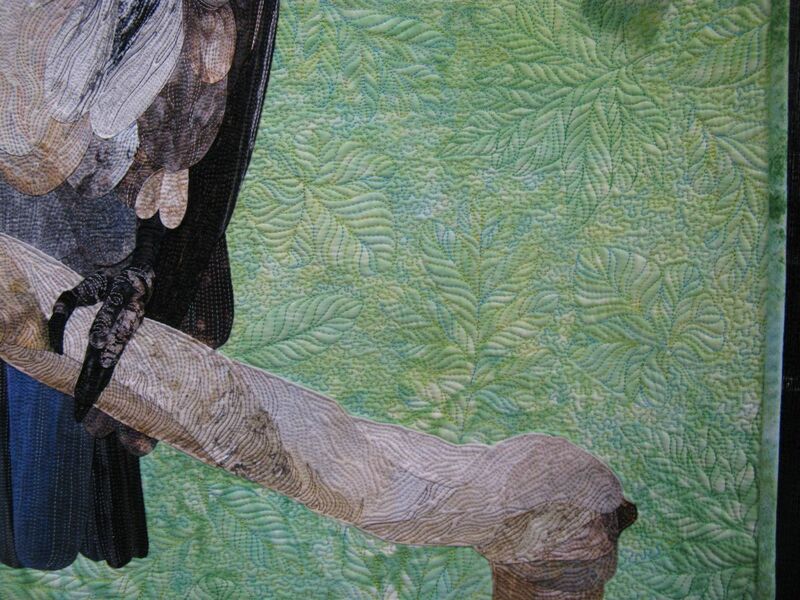 Taylor had put more leaves in the background of his quilting, surrounding those with small stippling stitches. 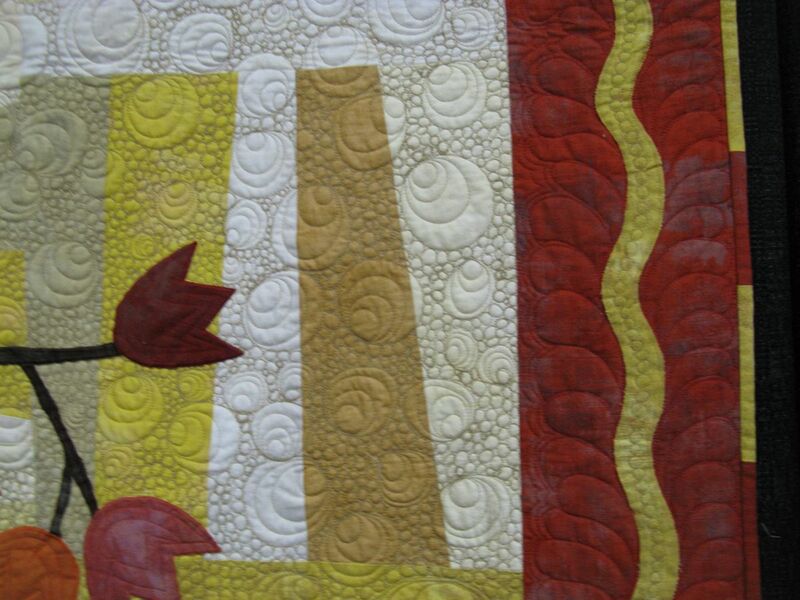 The branch had more texture added by the quilting. The white-gloved lady held it up to show me the back. Exquisite. 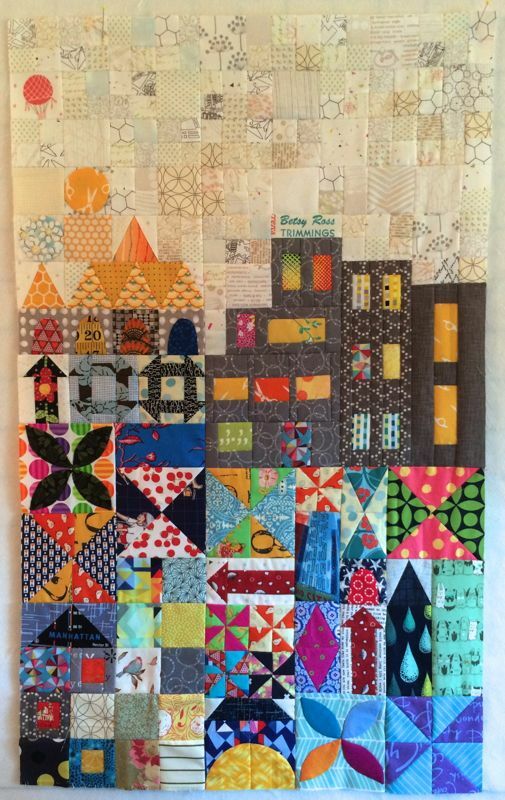 Taylor writes “I believe this is my most accomplished quilt to date. The technique I have been trying to master for the past 12 years. 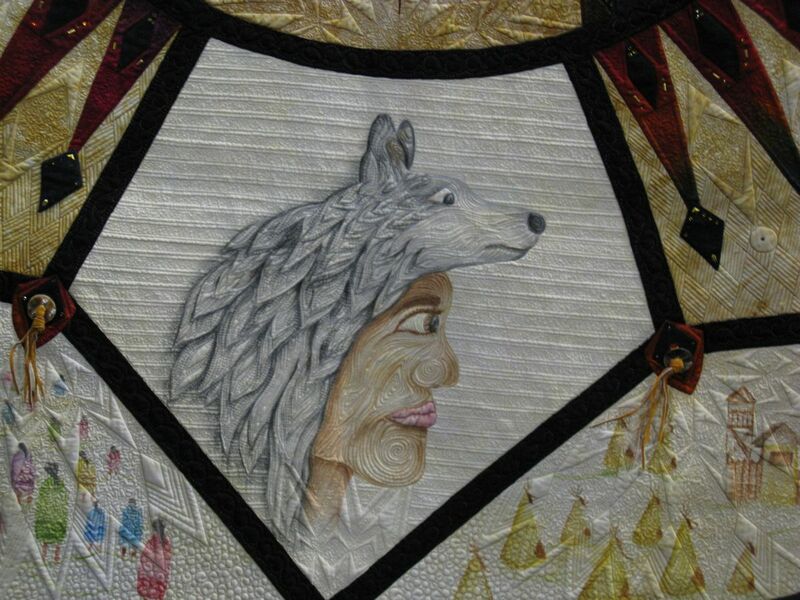 . . was to create an appliquéd quilt that appears to be a photograph or painting at first glance.” I’d say he succeeded. 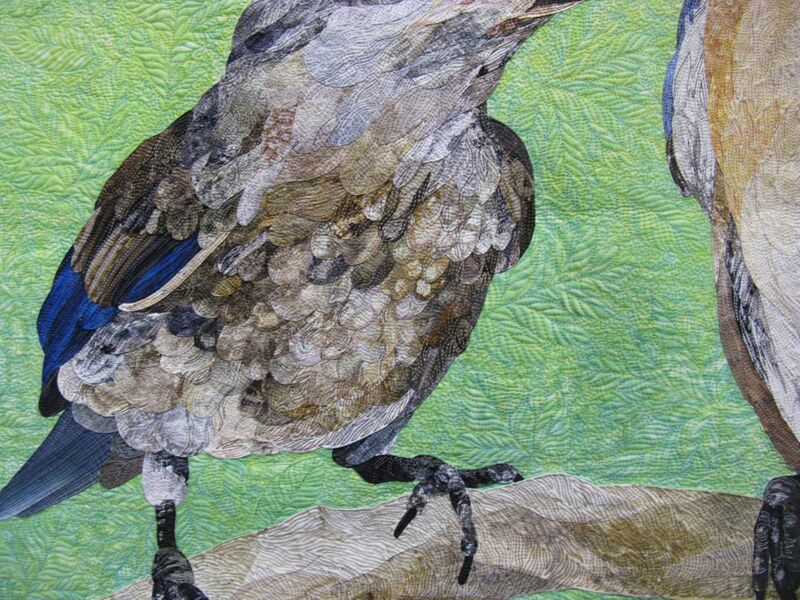 All of these feathers, the claw, all pieces really, are needle-turned appliqué, with the quilting enhancing the shading and structure. 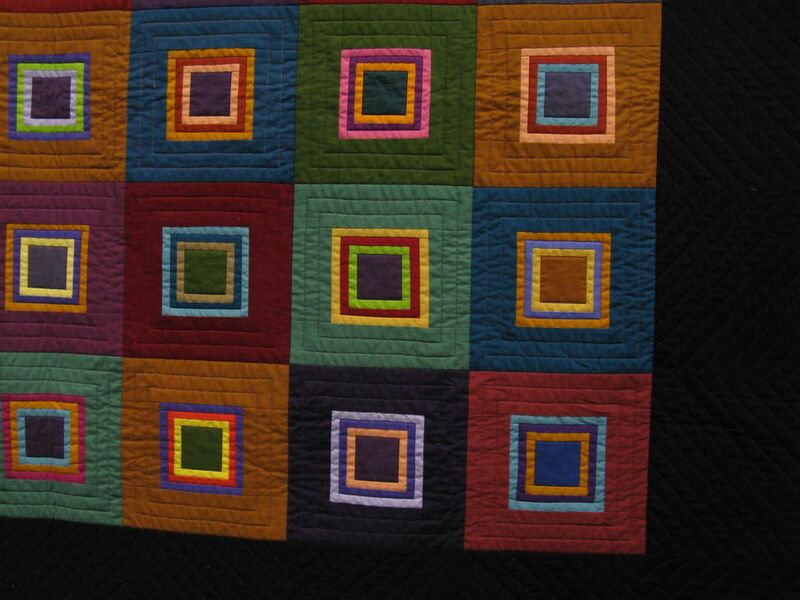 A masterpiece of a quilt. 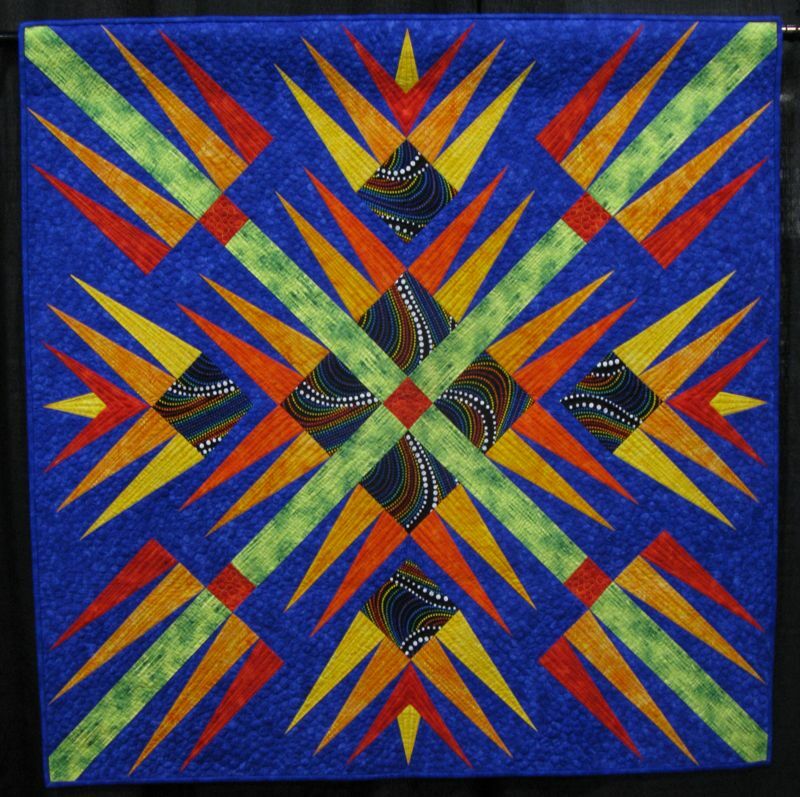 While some might aspire to be the big old blue ribbon winner at the front of the hall, by the CD-selling harpist, I aspire to create quiet quilts of detail and story like this one. I loved it! 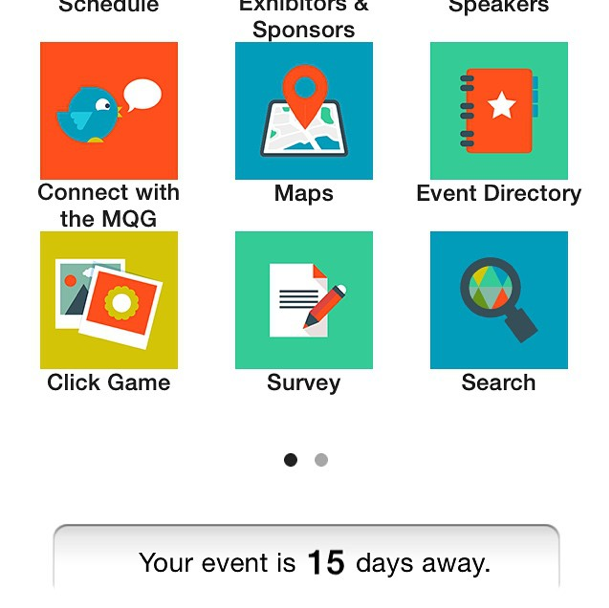 And that’s all folks–see you next year!! Posted on September 13, 2013 by Elizabeth E.
While visiting relatives in Utah, just before I tucked into the new semester of teaching (which would explain why I have been AWOL for a couple of weeks), my husband and I headed to Salt Lake City’s newest museum: The Natural History Museum, high up above the University of Utah. 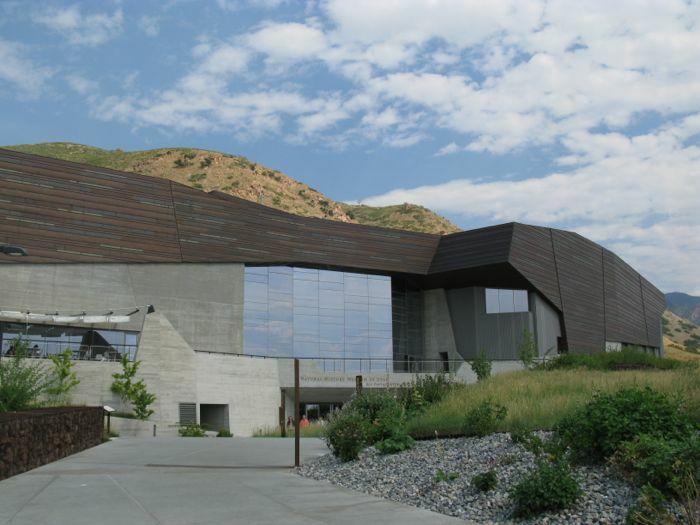 It is a gorgeous museum, complete with artifacts, history and dinosaur bones. 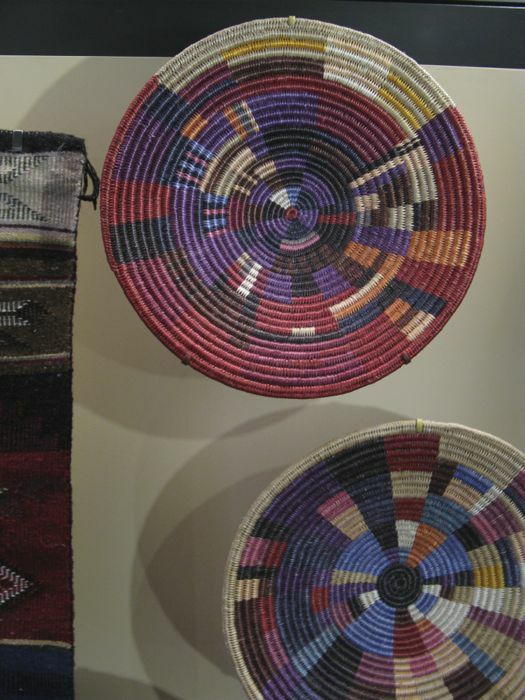 But I was more interested in the woven baskets in the Native People’s exhibit. I guess I’m fascinated by color and pattern, in all forms. Which is why I found this piece of art, in the Millcreek Library so fascinating. That library, where my sister-in-law Annie works, has a Senior Citizen’s center, a gym, a cafeteria and of course, art. 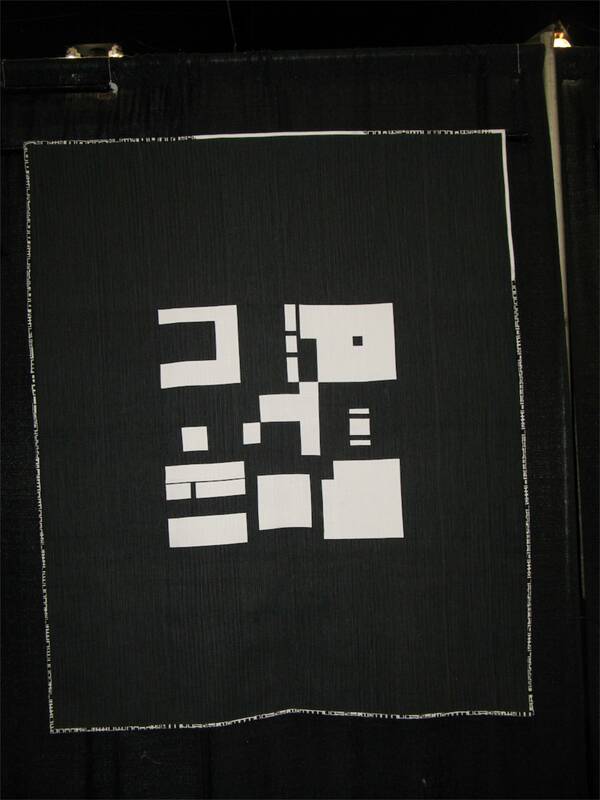 This appears to make of some sort of plasticized material–almost like a thin linoleum, cut and sewn in quilt patterns. I loved it. 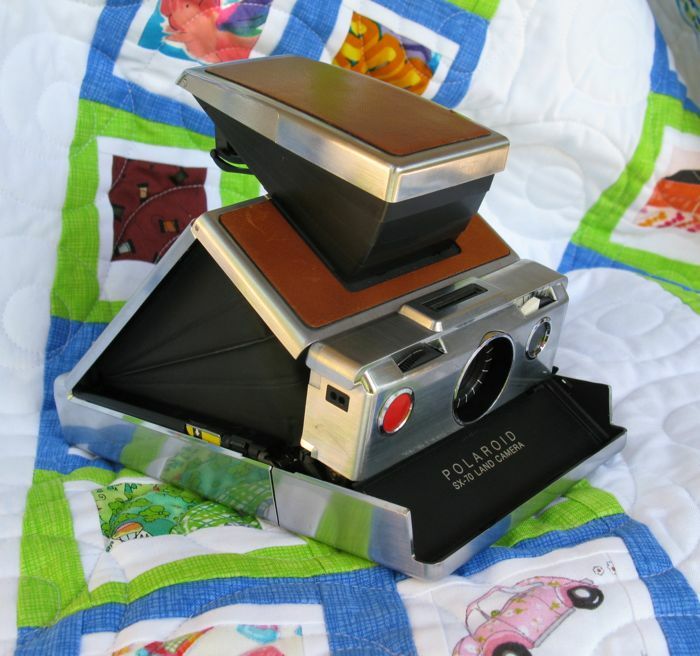 I had brought up my Polaroid Quilt to show my mother, and my dad held up his finger as if to signal a pause and came back carrying this: a genuine, bonafide Polaroid camera. 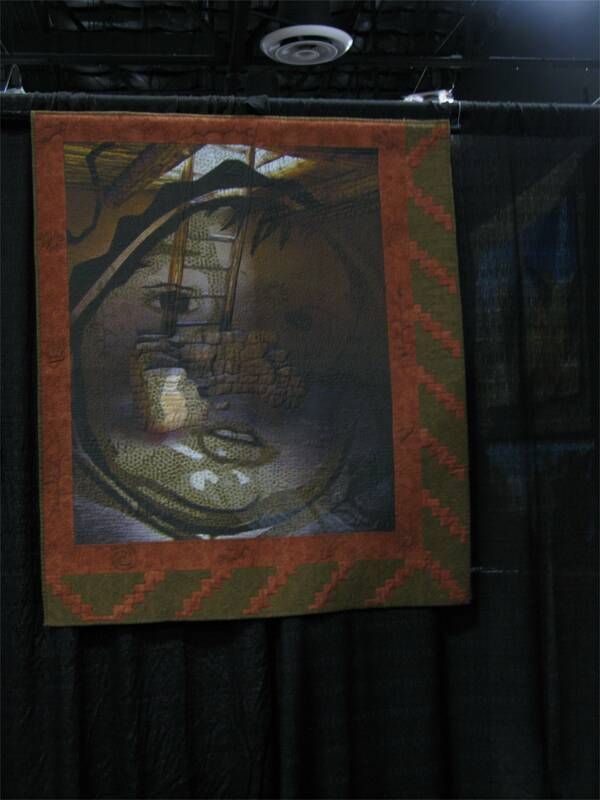 Of course, there’s not any film to be found for it anymore, but I thought it deserved a picture with the quilt. 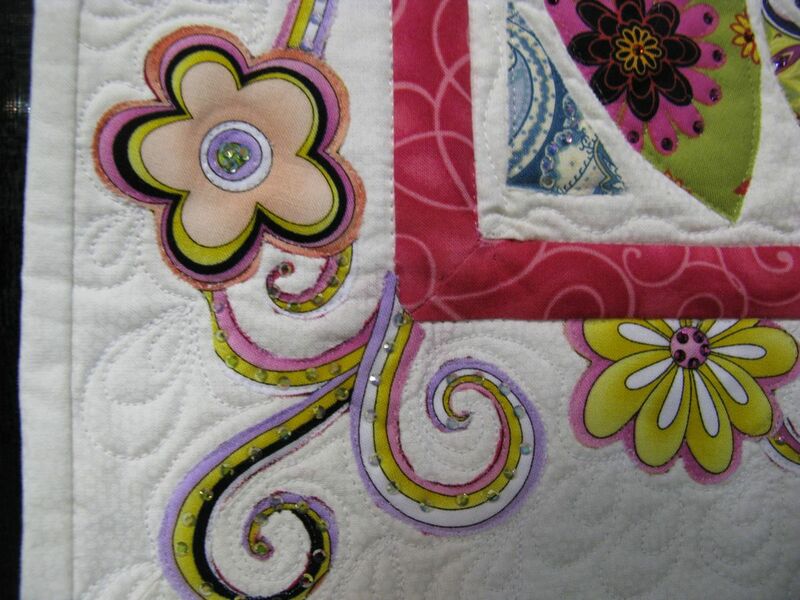 Detail of the beautiful quilting. 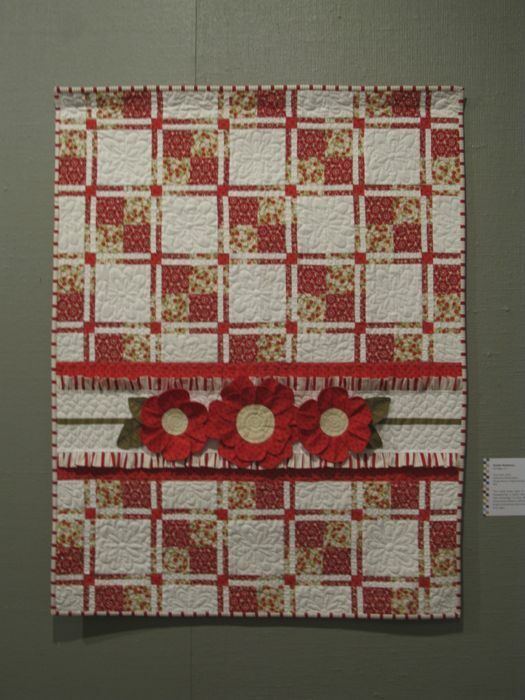 Kristen Roylance’s quilt Posy Patch was made using a modified disappearing 4-patch block, and was quilted by Molly Kohler. The dimensional flowers were charming. 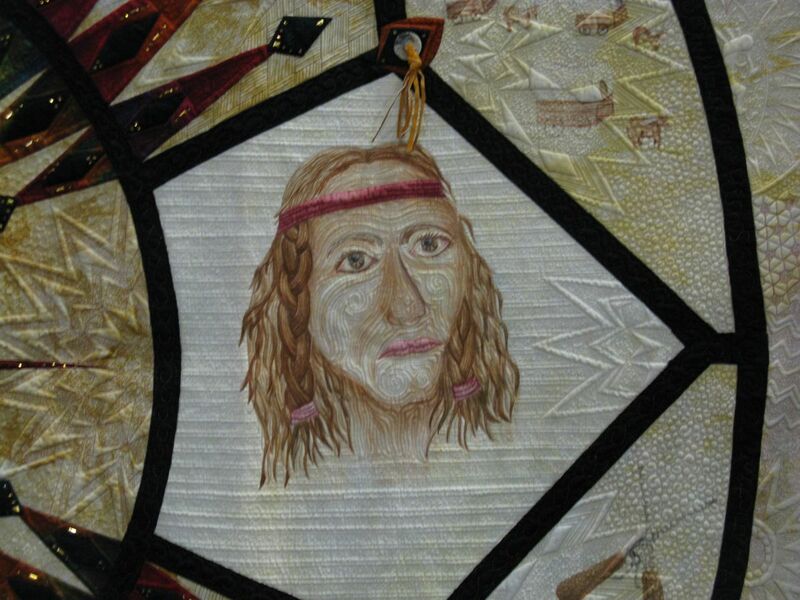 I snapped this one without noting who made or quilted it–it’s really beautiful and detailed. 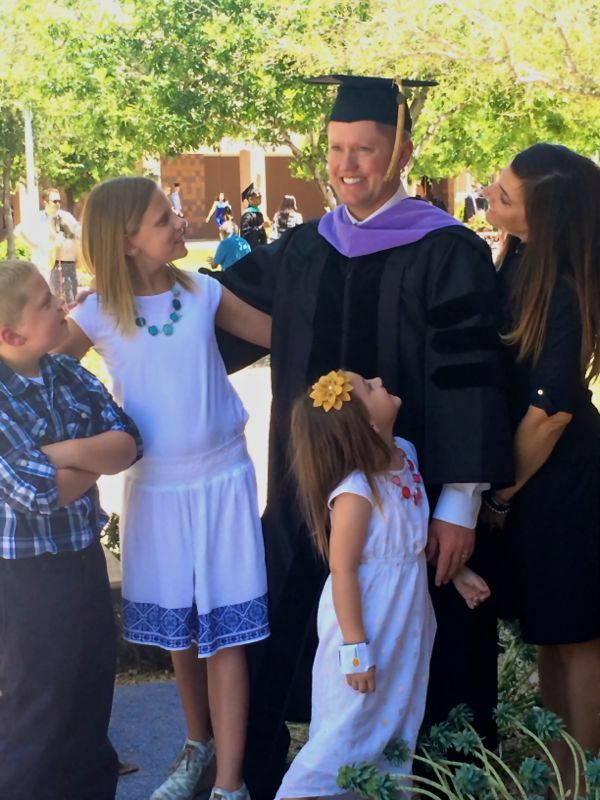 “Look, honey,” I said to my husband. 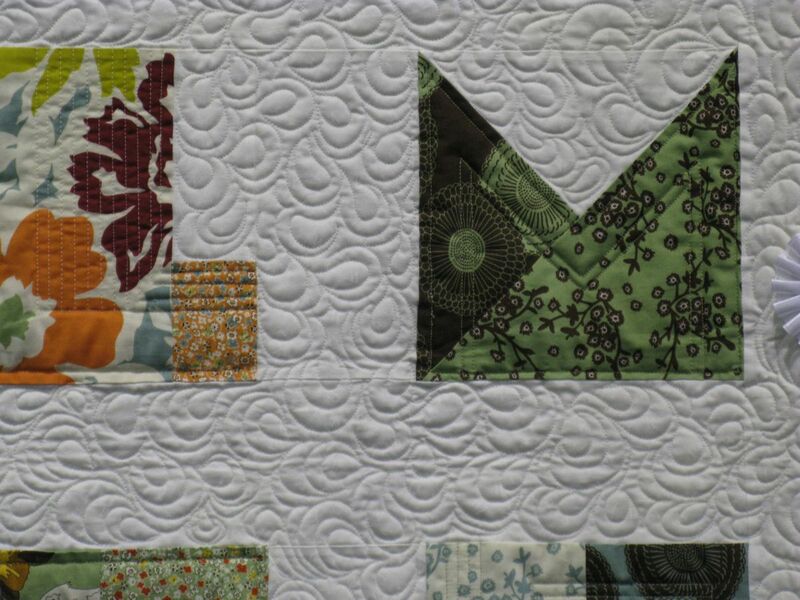 “A Dear Jane quilt!” “Dear what?” he said. 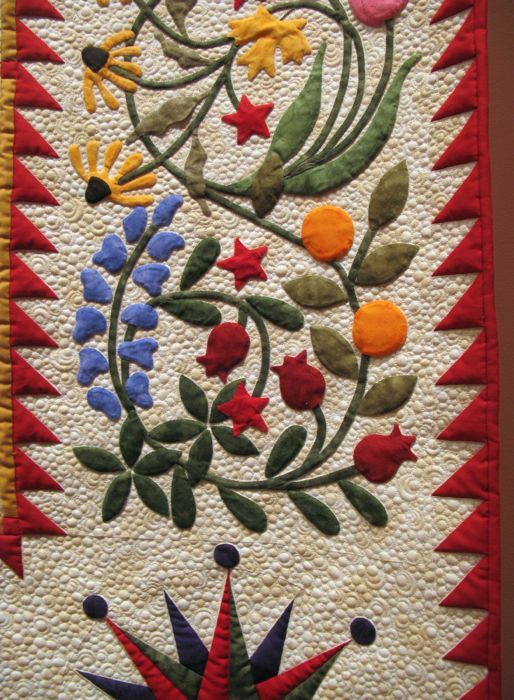 The title of this one is Dear Jane Invites Hannah for a Dutch Treat, and is made and quilted by Shirley Olsen. 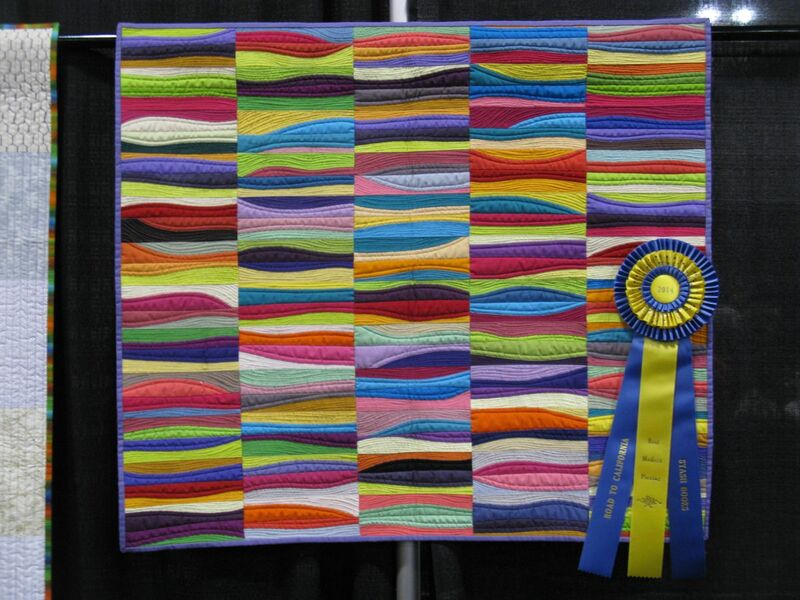 It was a masterpiece and earned an Award of Excellance from the judges. 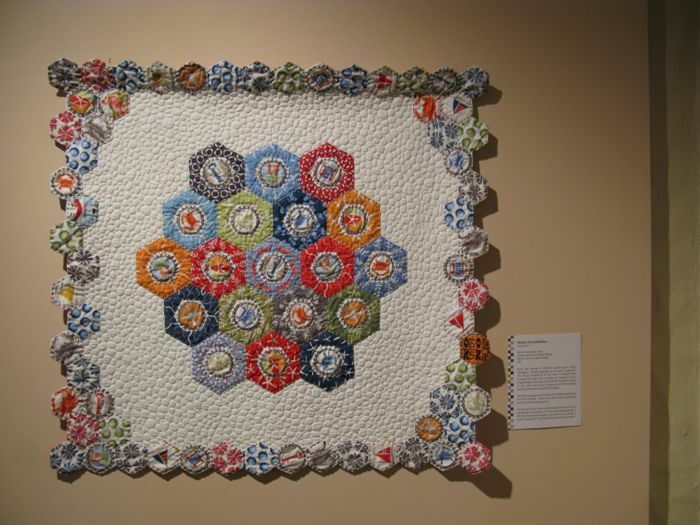 Marion McClellan’s Bottle Cap Bangles is a fun use of hexagrams and fussy-cut fabric. 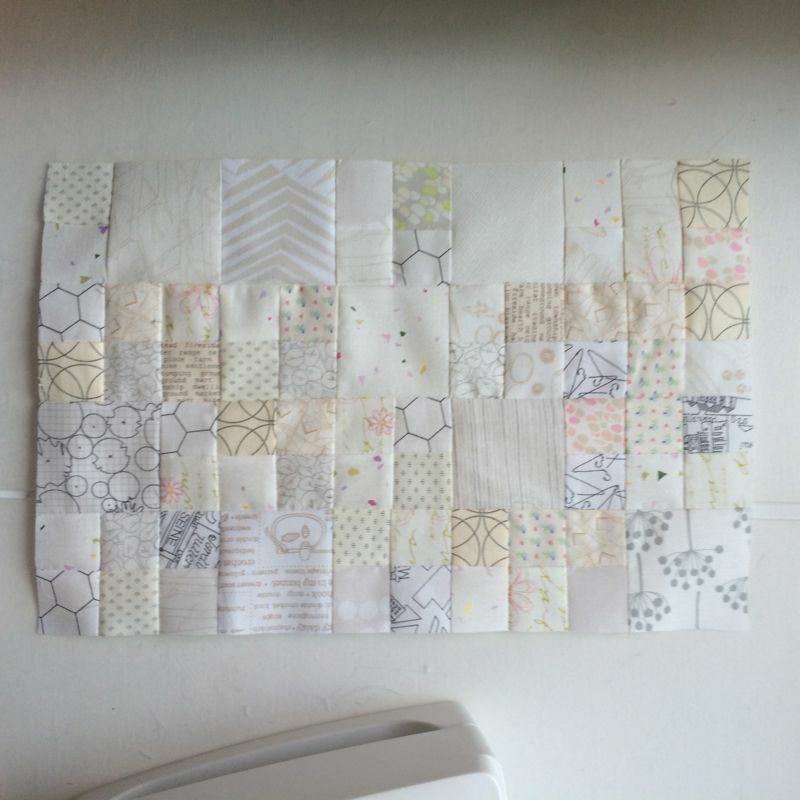 She also quilted her piece. 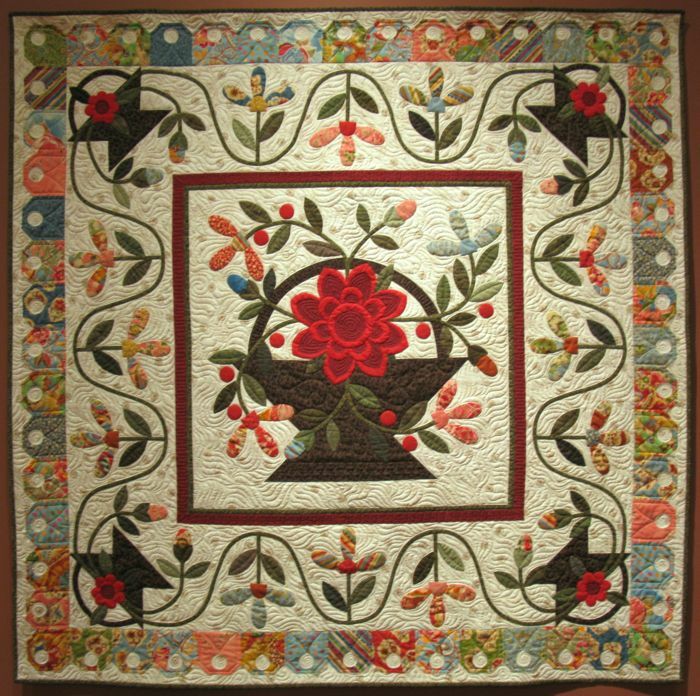 This quilt, Zinnia Basket, was made and quilted by Patti Jacobs, from a Kim Diehl pattern. 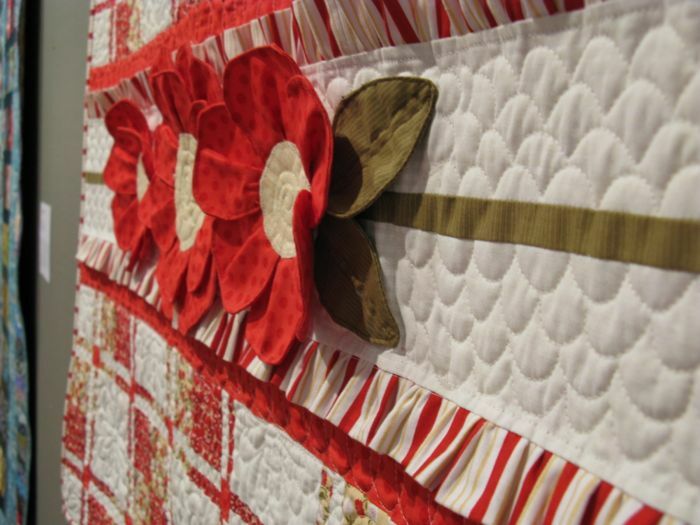 Apparently she used to think that quilters were nuts to “spend time doing hand appliqué when you could sew the pieces on with the sewing machine,” but now is a dedicated lover of appliqué. I really liked the border. 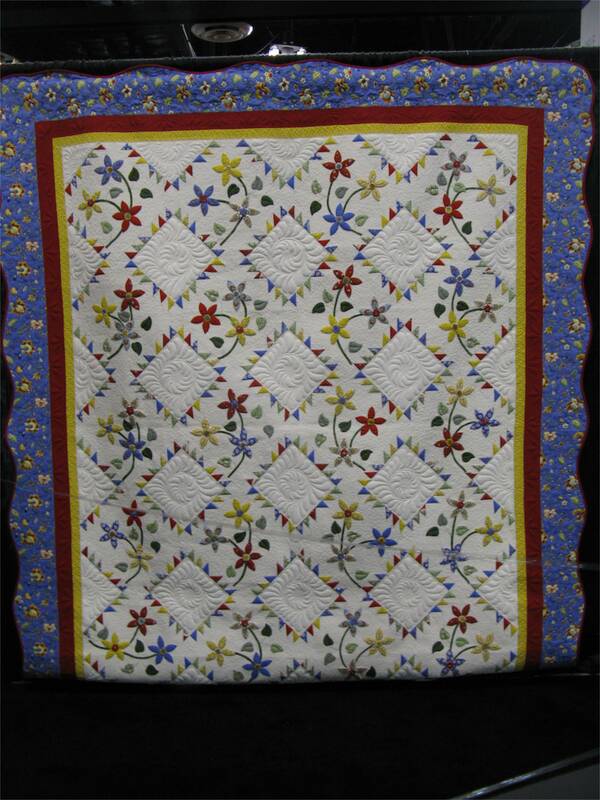 Kaye Evans quilt, Just One Weed, is named for the dandelion hexagon in the middle of the quilt. 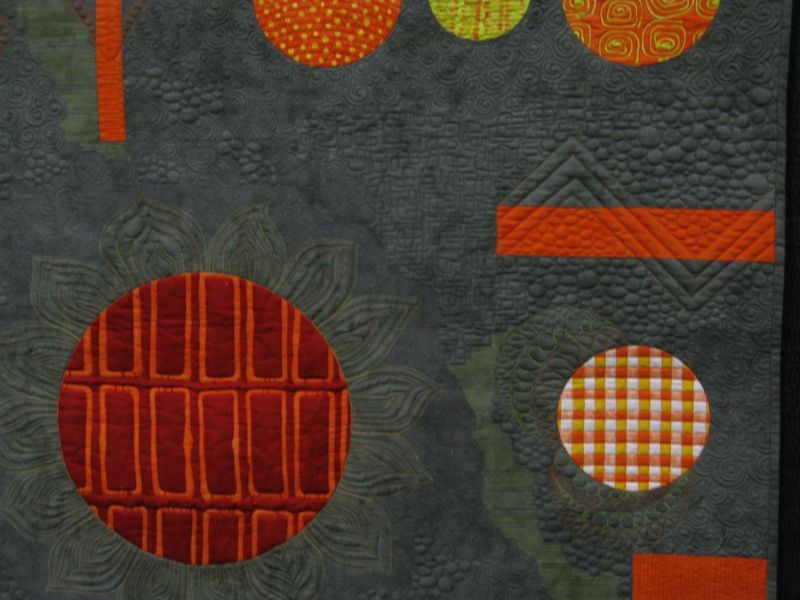 It was quilted by Sue McCarty. 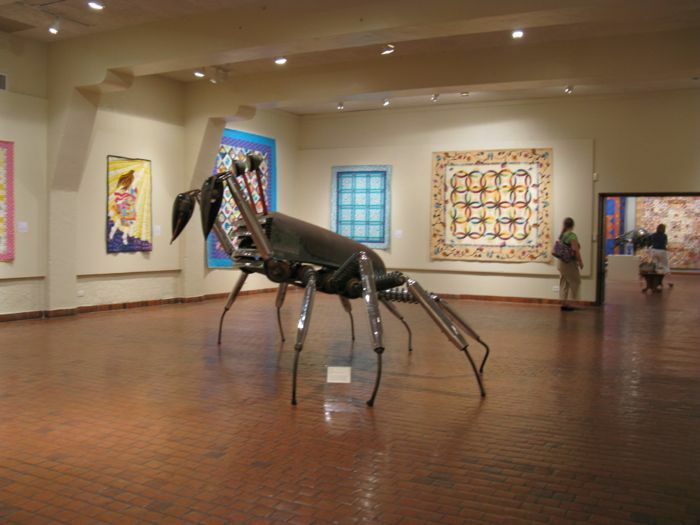 The quilt display was merged with a display of giant critters made out of auto body parts, springs, doodads and whatevers. 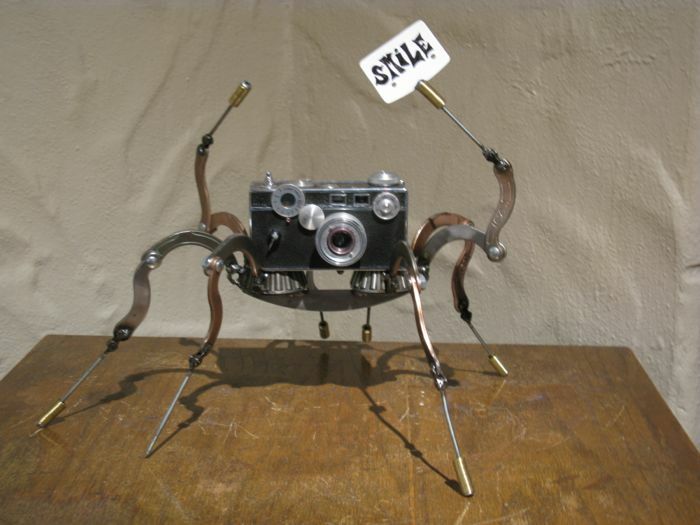 I liked Tim Little’s Camera Bug the best. 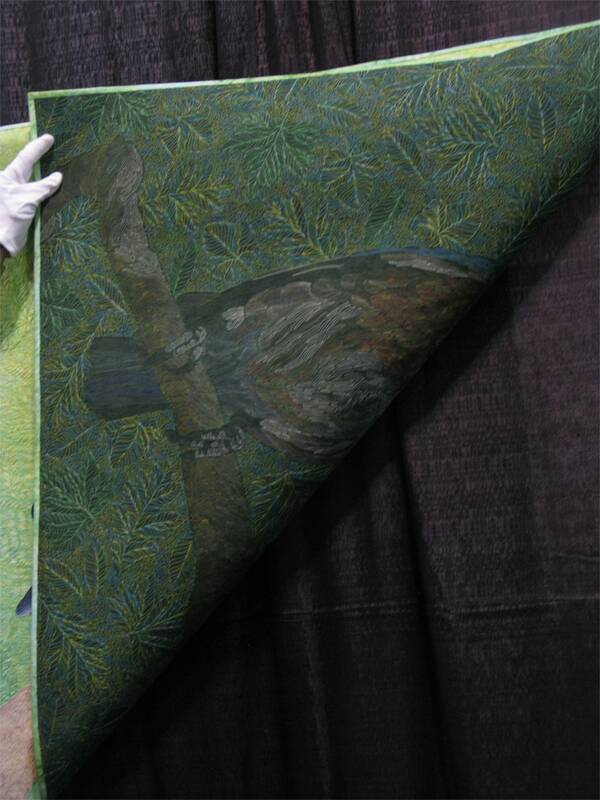 My husband knows just what to do at a quilt show: become like a camera bug and start taking photos. Many of these photos are his–he’s a delight, but was probably relieved that there was no vendor mall here. 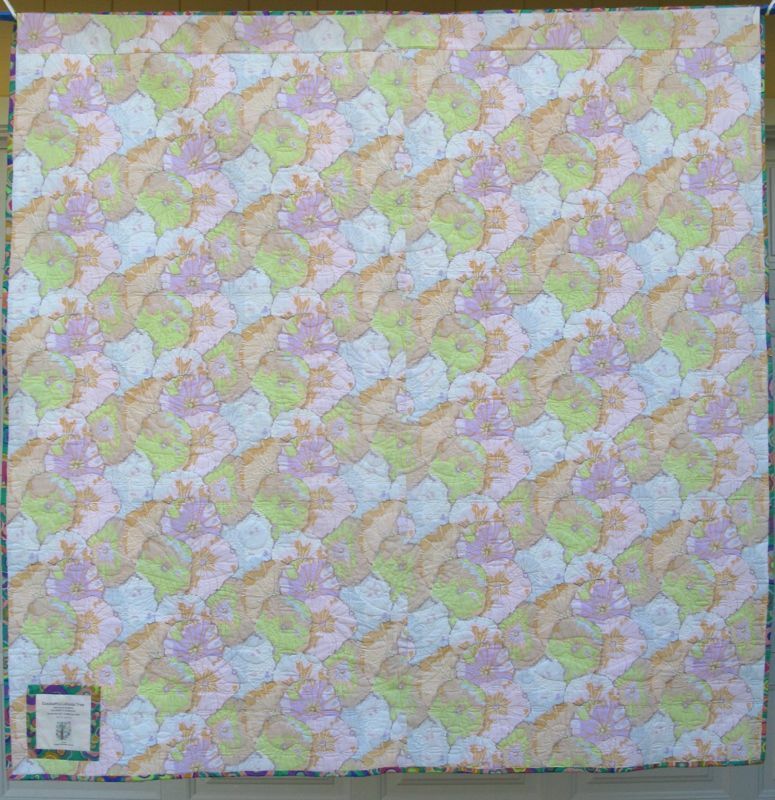 Ladies of the Sea was made by Karin Lee Crawford and quilted by Judy Madsen. 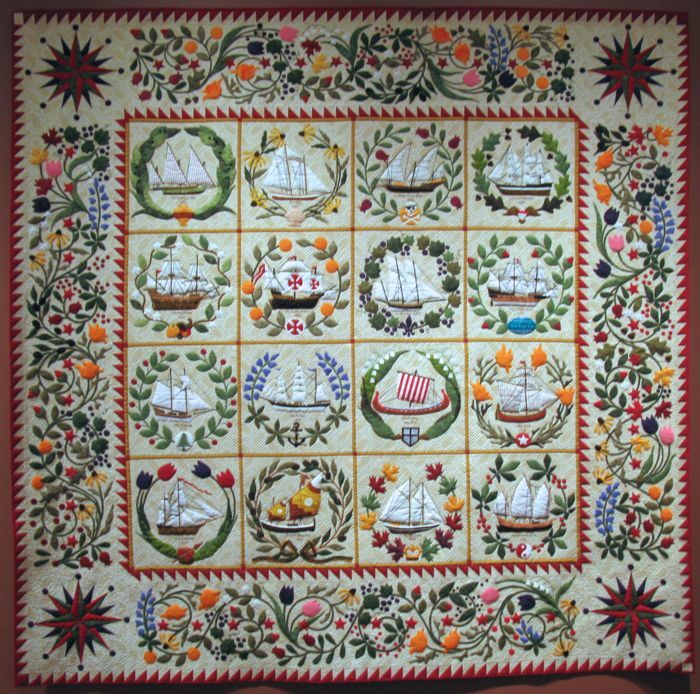 It was a pattern from Sue Garmen depicting famous rigged sailing vessels from around the world. Detail. 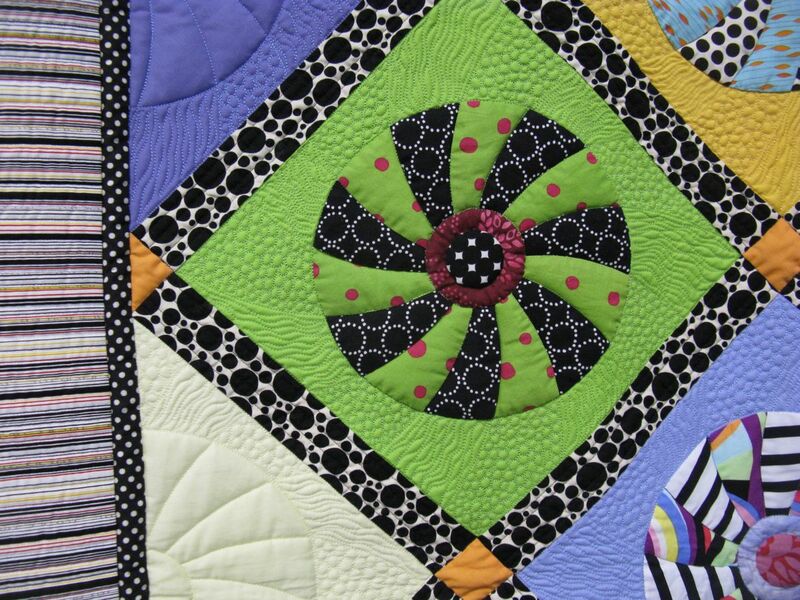 I have to assume that the quilter is really Judi Madsen, of Green Fairy fame, but I could be wrong. 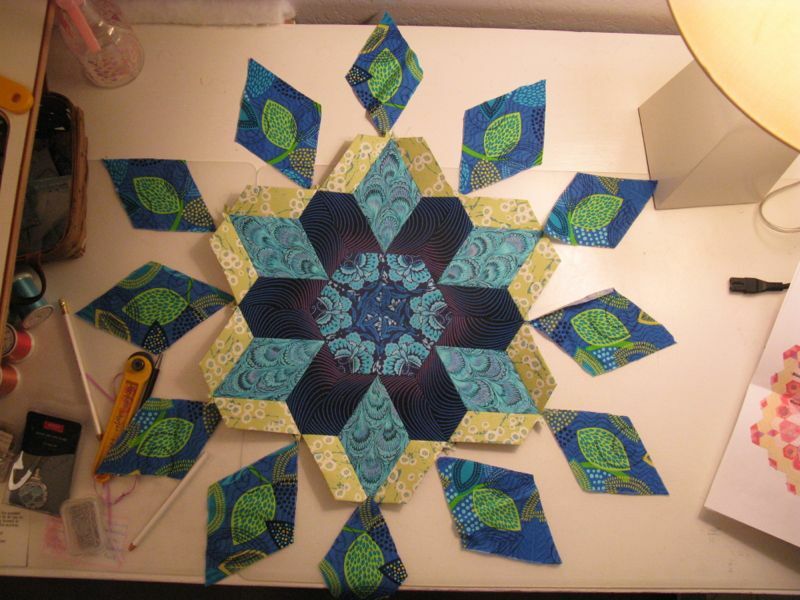 It was gorgeous in both the making and the quilting. 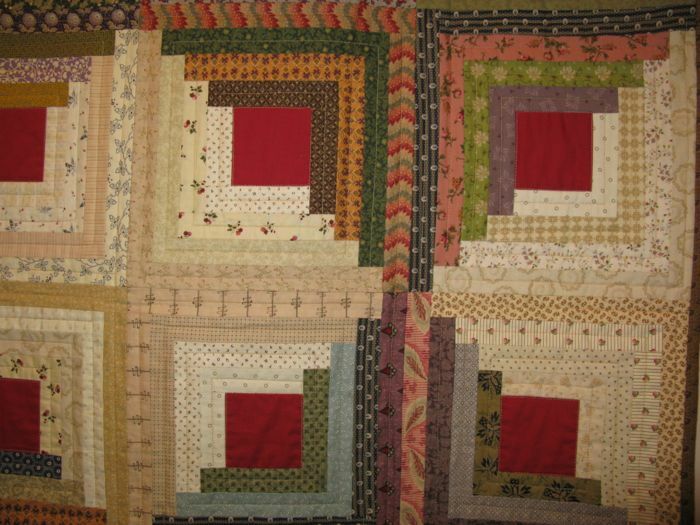 And to finish up this little quilt show, a Log Cabin quilt. 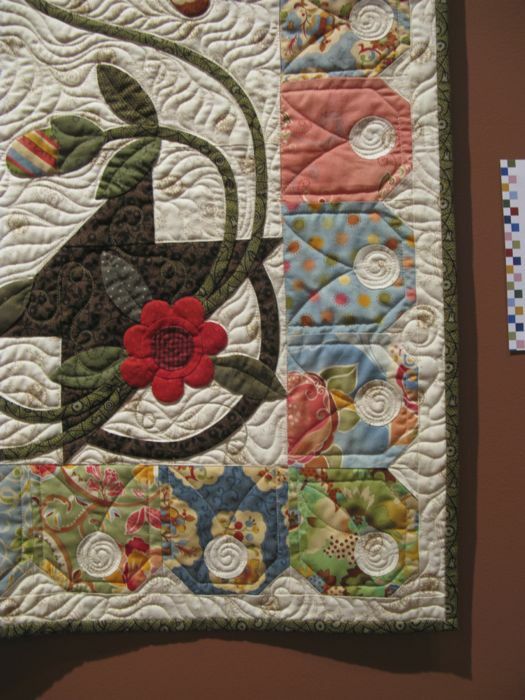 Megan Christensen made the quilt, but didn’t identify the quilter. 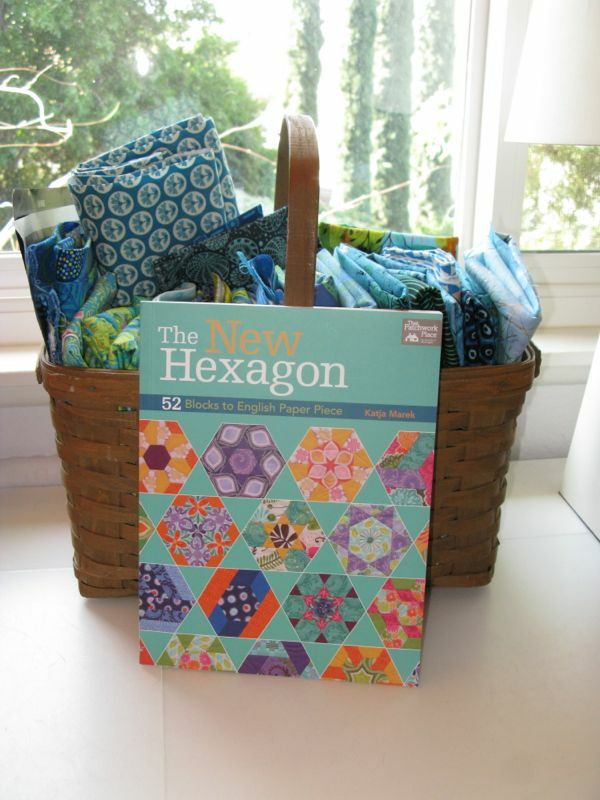 The title is A Good Use of Scraps, inspiring us all to get going on our scrap baskets!